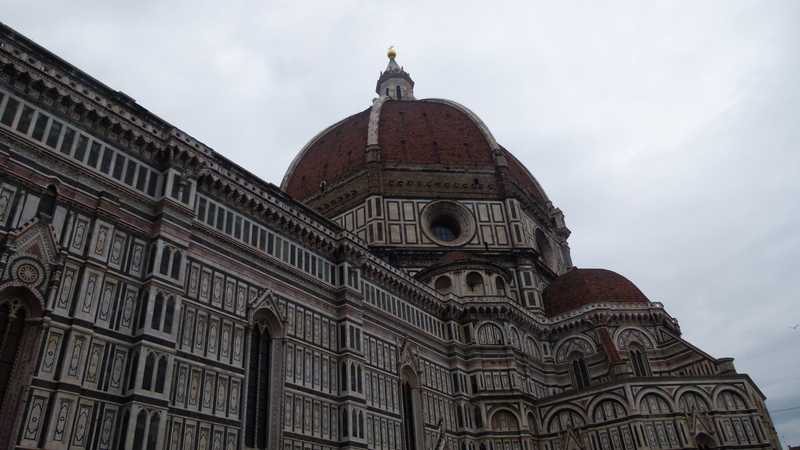 An old dream of mine becomes true – I walk through the streets of Florence, for eight days, and I soak in the culture and history of this lively town. It is all within walking distance. It is said that tourists repeatedly end up in hospitals. Diagnosis: Culture Overload. Se non è vero è ben trovato (if it is not true, it is a great story). 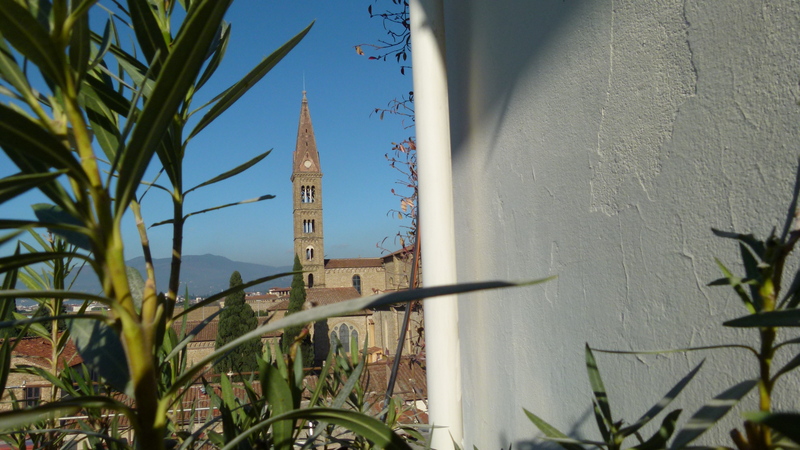 Situated on a hill north of Florence is Fiesole. 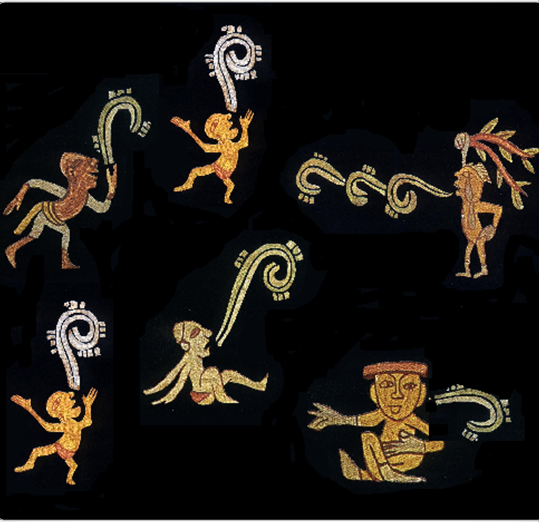 The Etruscans founded it far above the Arno by to avoid the floodings. 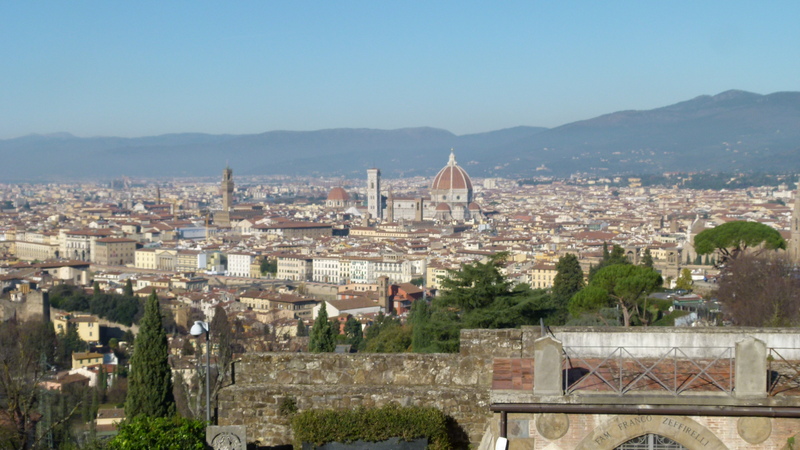 In 59 BC the Romans established Florence next to Fiesole. 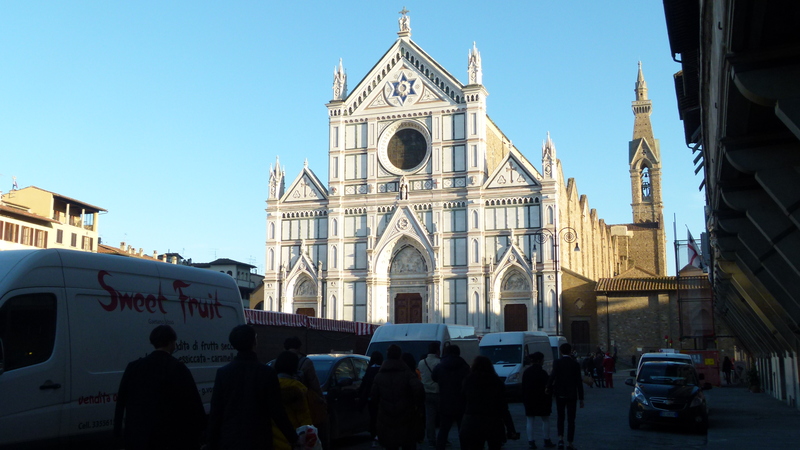 Diokletian made Florence the capital of Tuscany and Umbria. 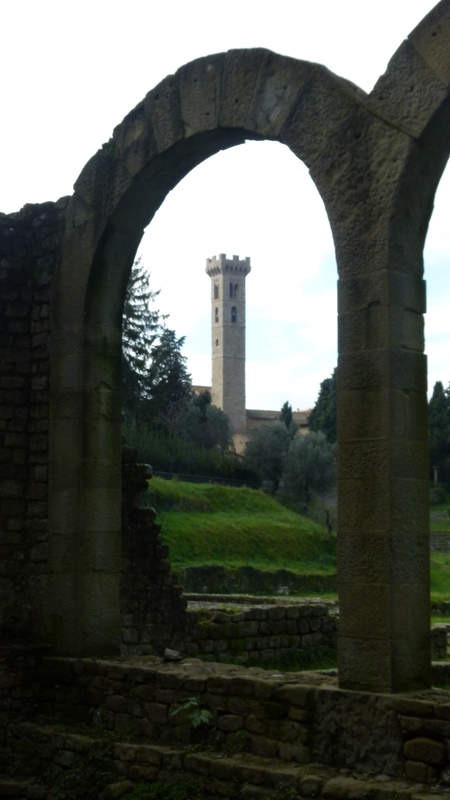 Medieval Florence conquered Fiesole (around 1000 AD). 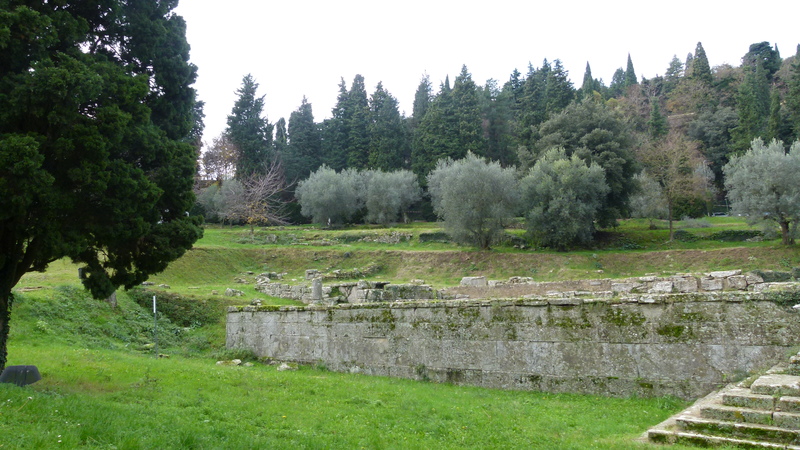 Fiesole shows the remains of their Roman city as an archaeological site open to visitors. 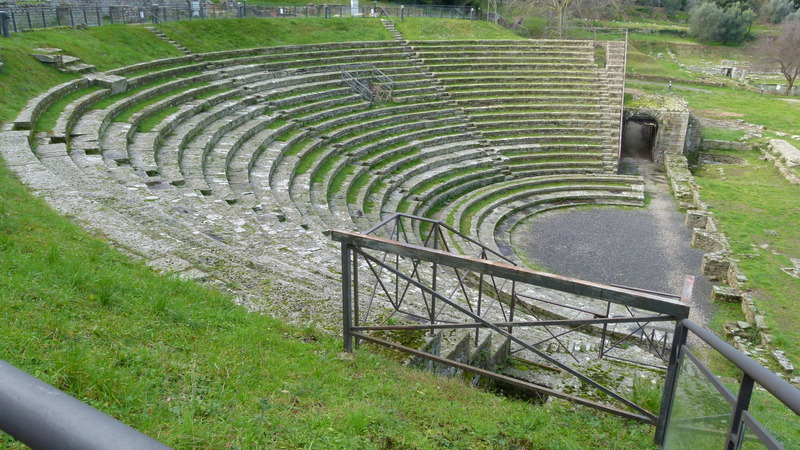 After a three day culture marathon with the Firence card, we now head to Fiesole to see the Roman remains and to look at Florence from above. 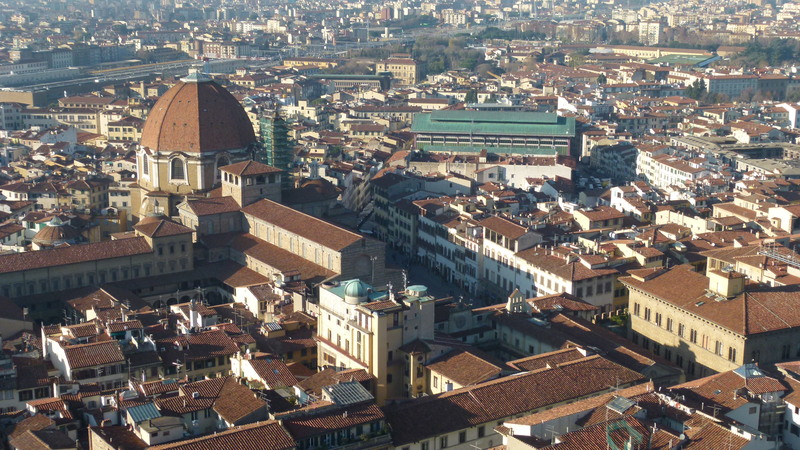 Besides giving access to museums and churches, the Firenze card also provides a bus ticket. We climb bus number 7 near Accademia in Via Giorgio. As the bus follows the winding road upwards, the gardens and houses are getting larger – a suburban residential atmosphere. 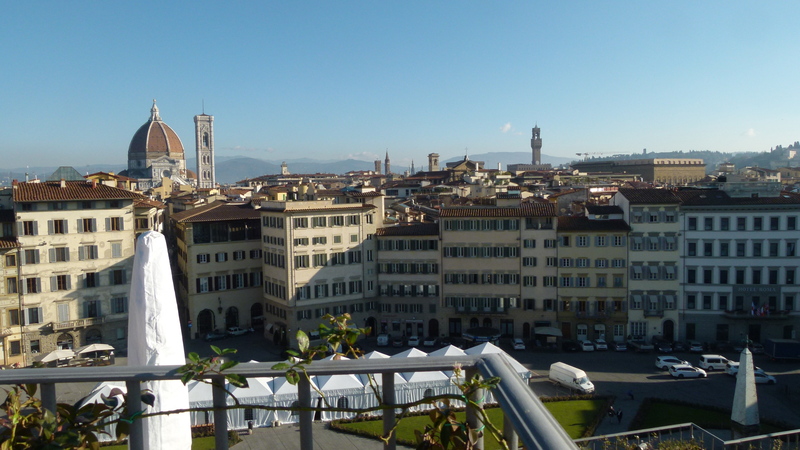 The view of Florence is spectacular. 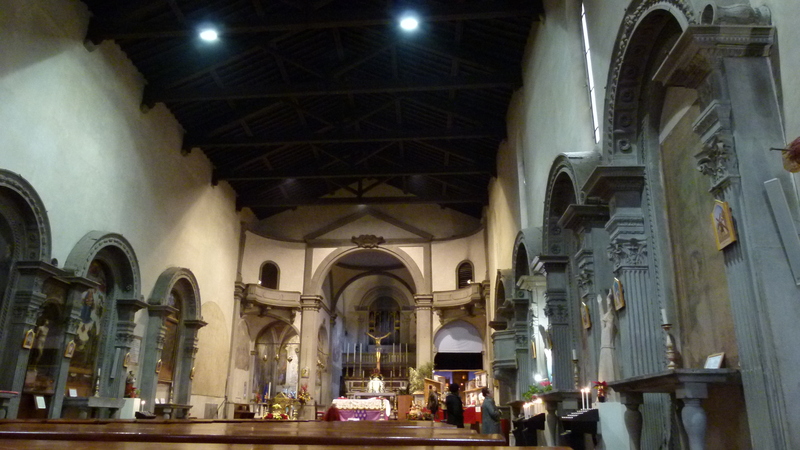 At Fiesole, we find out that the archaeology museum closes at 2 PM and now it is 12. No mercy, no lunch… Trying to calm down my empty stomach, I take a photo of these nicely set tables waiting for guests and I had a small power bar that Leni found in her bag. … and a cobbled Roman road. 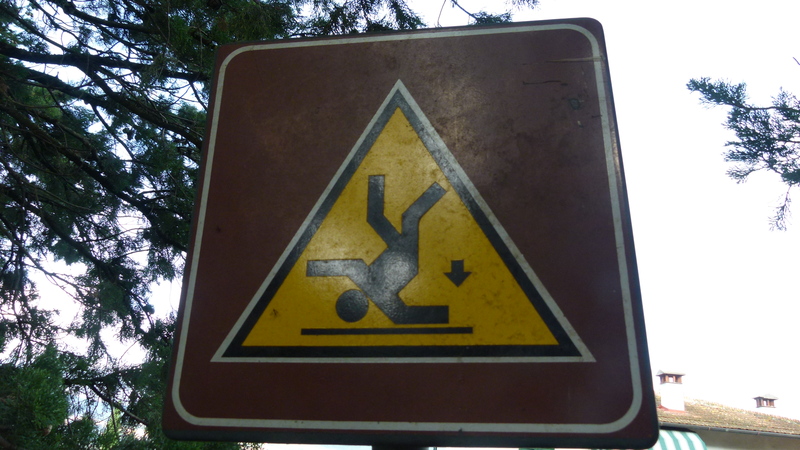 Beware not to climb around the ruins – this may be dangeorus. 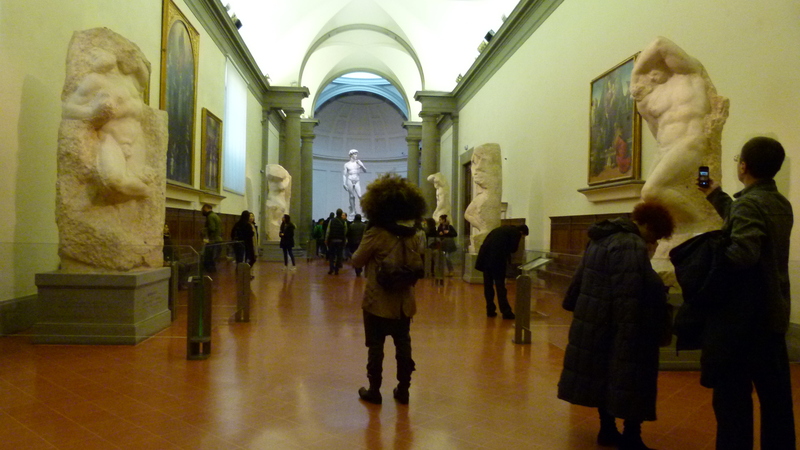 We have a short look at the museum, but the guard warns us of a “terremoto” and does not let us access the upper levels. A terremoto? Why a terremoto? 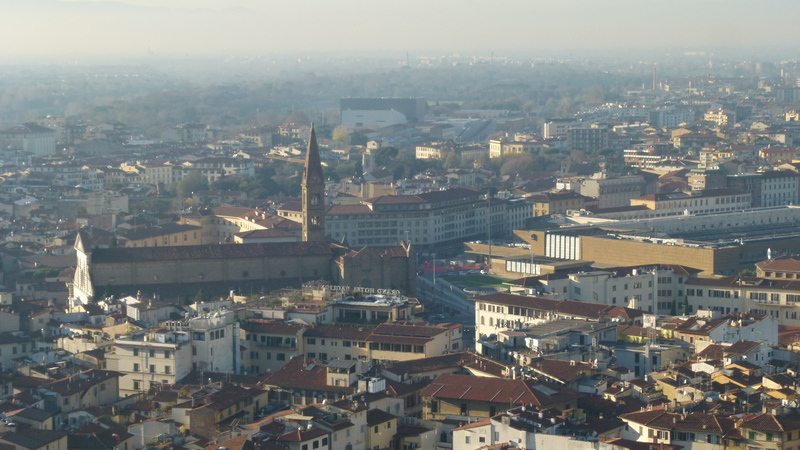 We learn later that at 11:36 a terremoto of 4.1 Richter magnitude scale has shaken the area of Florence. 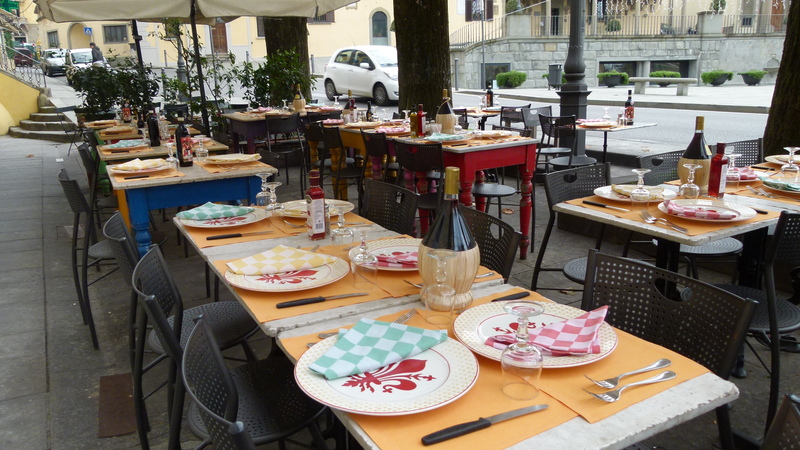 And this was the most serious of a series of earth quakes hitting the Chianti area today. 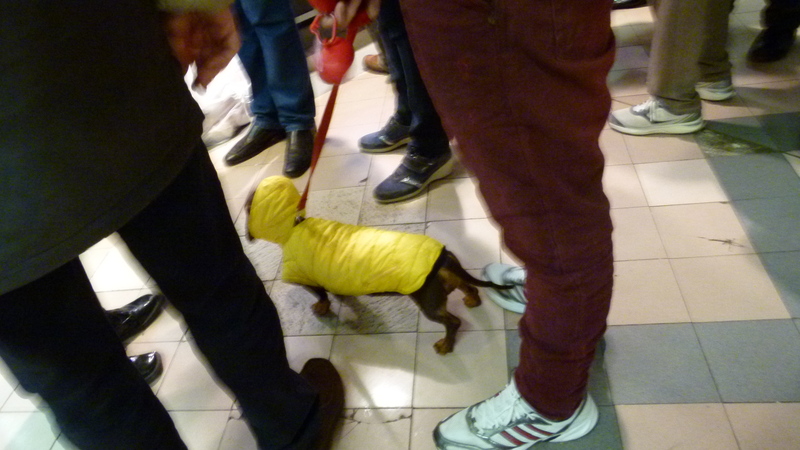 Sitting in the bus, we had not noticed anything. We only observed that the cupboards in our hotel room were shaking, when there was a minor earth quake of about 3 around five o’clock early the next morning. 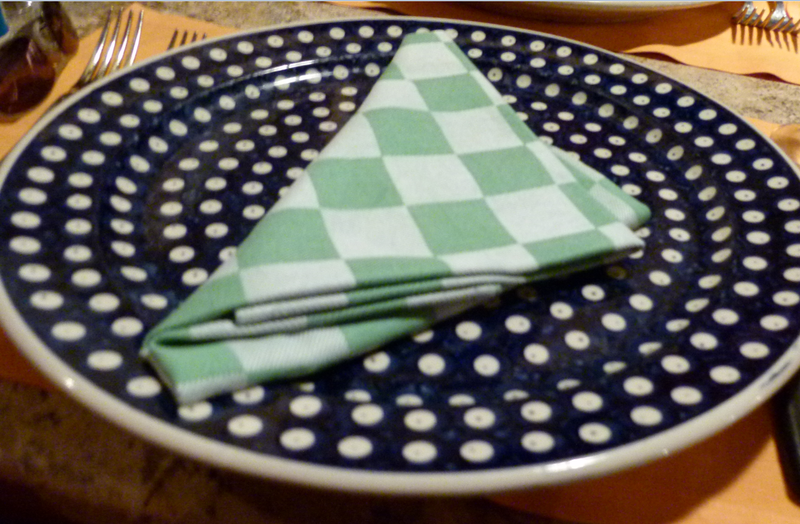 … and soon enjoy a crunchy pizza on the rustic blue plates with the white dots. The bus number 7 takes us back down to Florence. 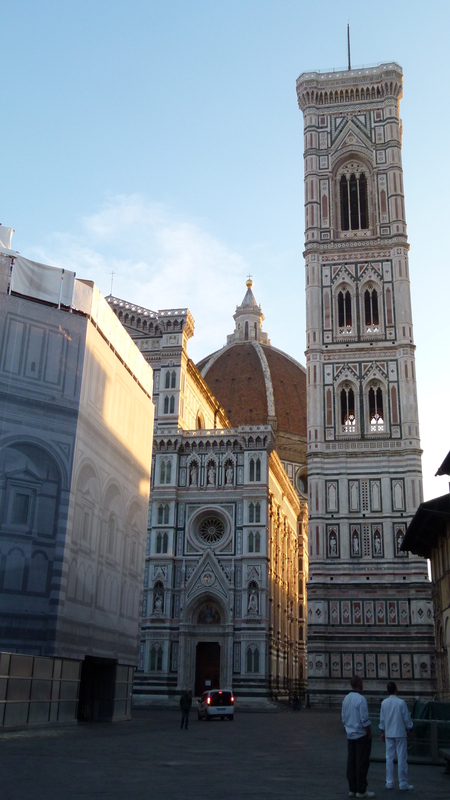 Again we dive into the streets of Florence, this effervescing city. 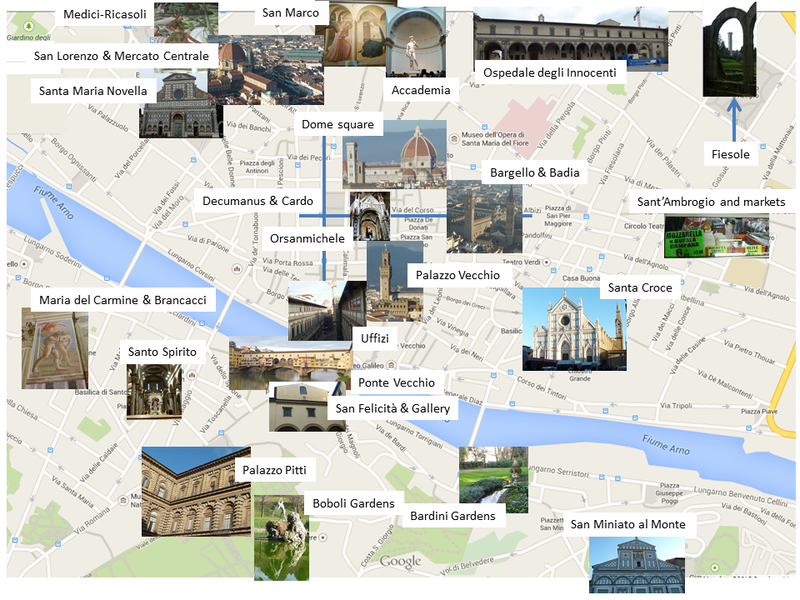 Let us now look at more museums, namely the Palazzo Pitti, the Uffizi and the Accademia. 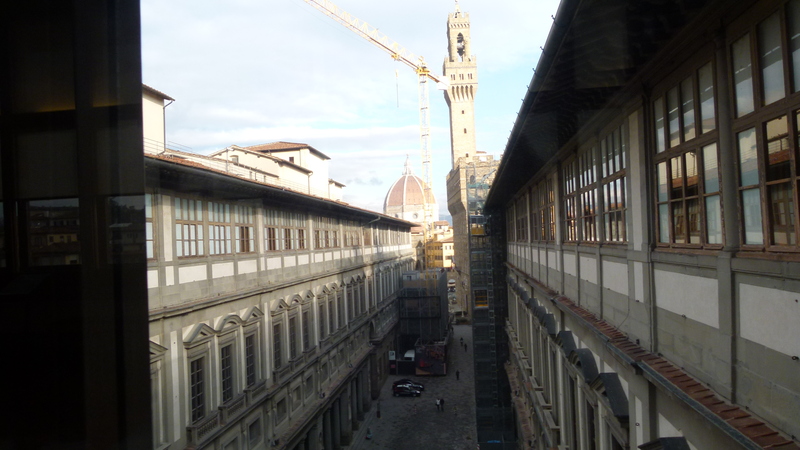 With Leni, I crossed Ponte Vecchio admiring the Vasari Gallery that leads from Palazzo Pitti to the Uffizi. 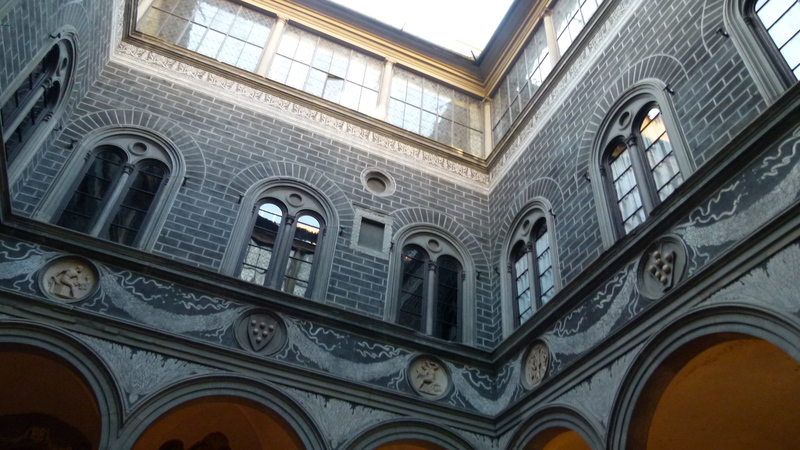 Vasari built this Gallery in 1564, after the Medici (now dukes reporting into Spanish Habsburg) had moved from the Palazzo Vecchio into the larger Palazzo Pitti. Using the Gallery they could walk from their new home to their offices and – at his point – even attend the service in Santa Felicita. The Medici named the Palazzo Vecchio “Palazzo Vecchio” after having moved to their new Palazzo Pitti, and they enlarged their new residence. 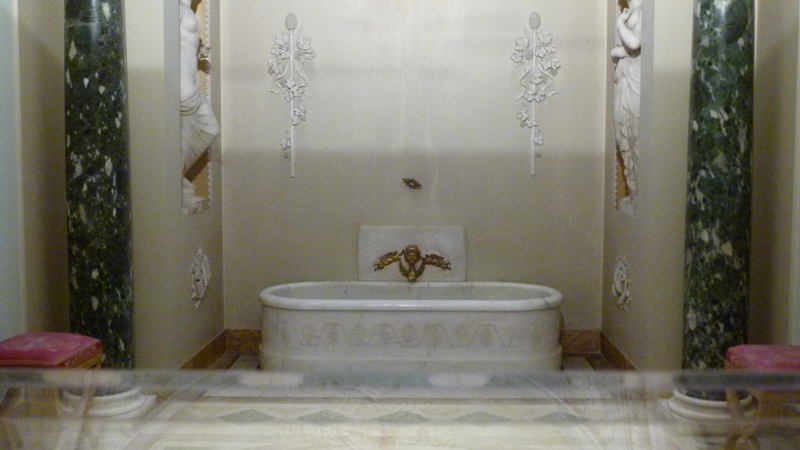 1813 – 1821, Napoleon had a bathroom here. And from 1860-1865 the king of newly founded Italy resided in this palace, for five years, until Rome became the capital of Italy. 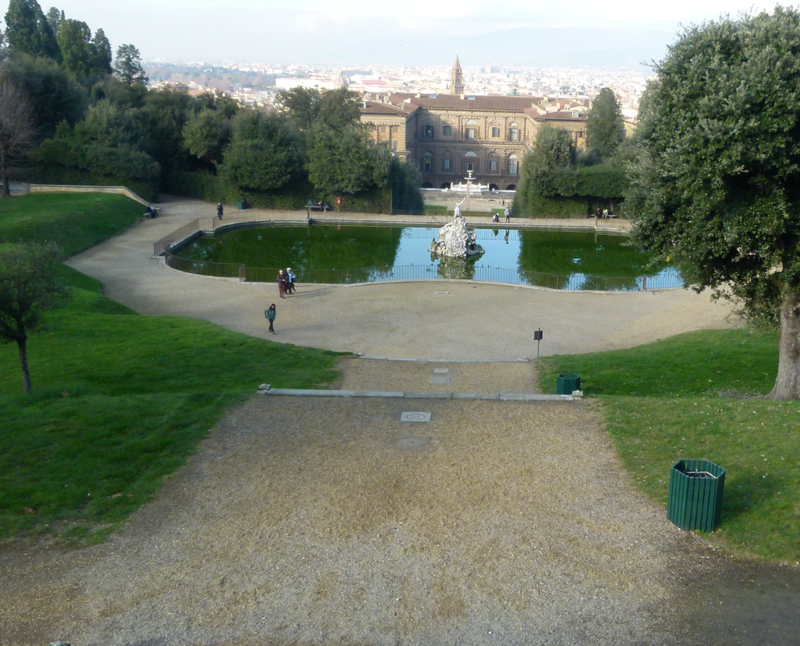 The gardens behind the palace are called Boboli gardens. They are huge. 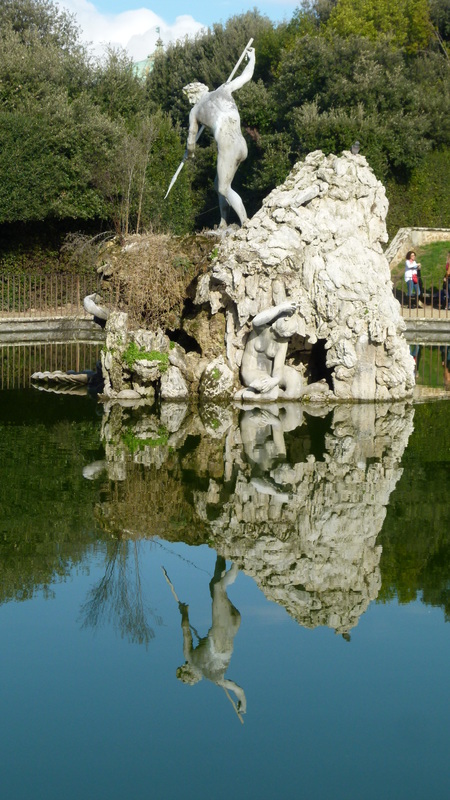 We climb the stairs and reach the fountain with hercules. We climb farther up and look back to the fountain, the palace and the town. 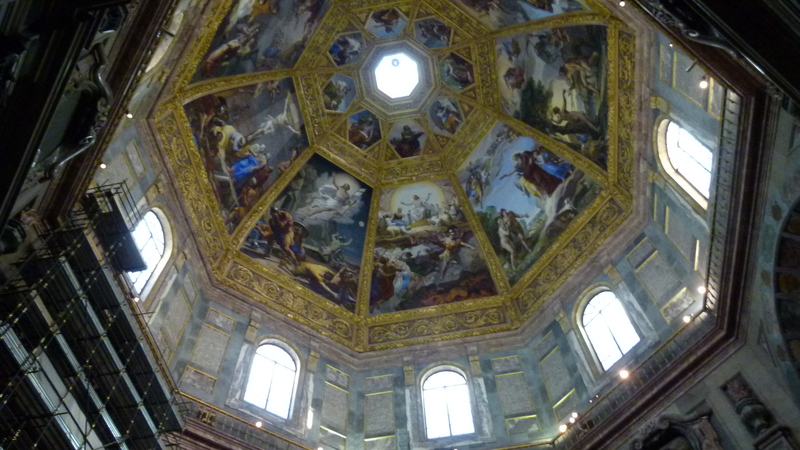 The Palazzo Pitti includes the Gallery Palatina that extends over several halls that are decorated with frescos by Pietro de Cortona (17th century). 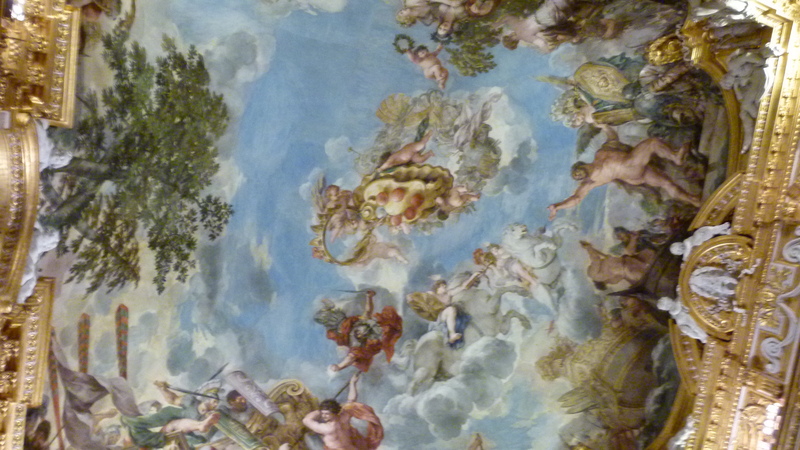 This is the allegory of war on the ceiling of the hall of Mars: It praises the Medici, as their emblem shows. 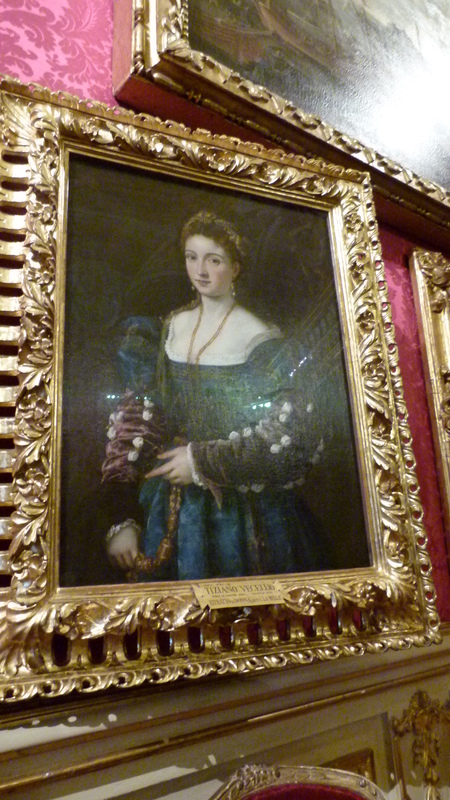 .. and this is “La Bella” by Titiano. I am impressed with her sleeves – not very practical, but she obviously did not have to do a lot of housework. 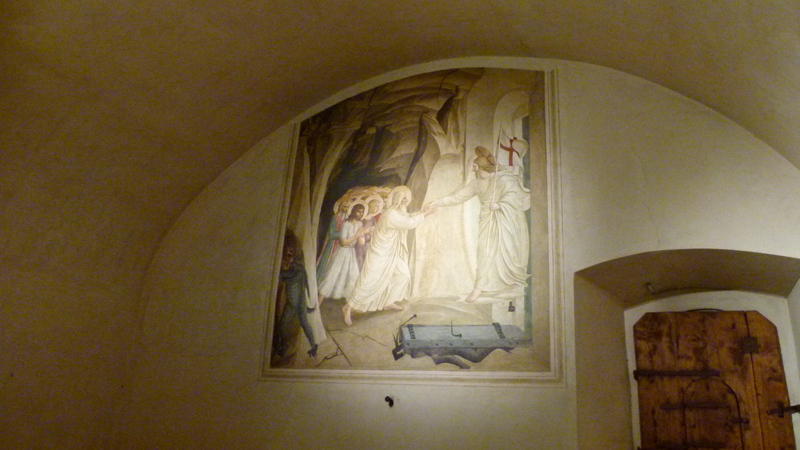 The Palazzo Pitti is also playing a role in Magdalen Nabb’s Marshal Guarnaccia Investigation stories. 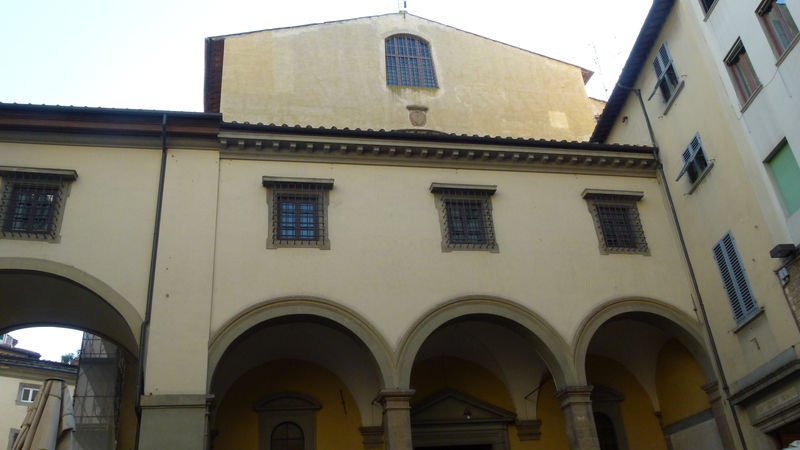 Guarnaccia works in the police station of the Palace and from here he uncovers the crimes that happen in the small streets around Santo Spirito. I have read “Death of an Englishman” and “Death of a Dutchman” – two great criminal stories with a lot of humor. 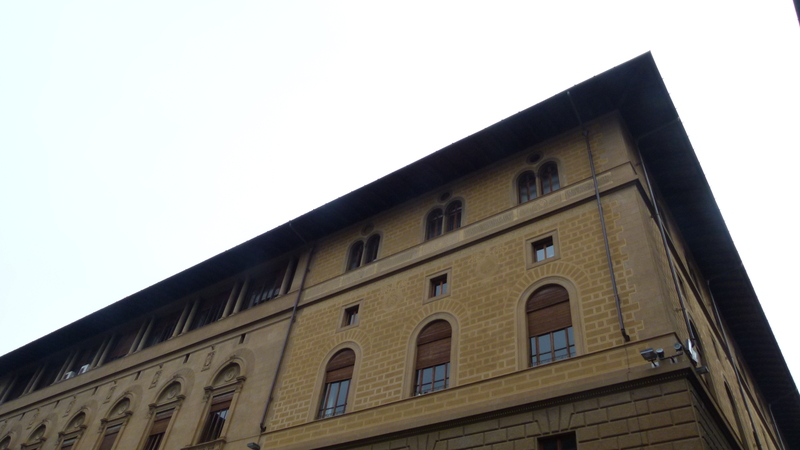 The dukes of Medici had the Uffizi built as an administration center. I feel like in a dream when walking up the large stairs to the top floor. There is a long corridor with many, many doors. For citizens, this maze must have been terrrifying. I remember Mani Matter and his song about such governmental corridors: “Är isch vom Amt ufbotte gsy, am Fritig vor de Nüne, by Schtraf, im Unterlassigsfall, im Houptgebäud, Block zwo, Im Büro 146 persönlich go z’erschiine, Und isch zum Houptiigang am Halbi Nüüni inecho.” – “He has been asked by the government to appear in the main building of block two in office 146, on Friday before nine and risking punishment, when not coming.” The poor guy gets lost in the corridors with all the many doors and never finds a way back. 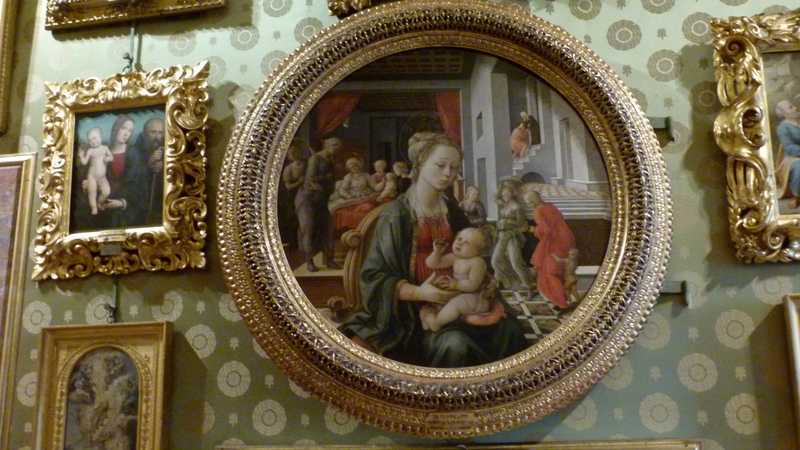 Perhaps, Mani Matter was in the Uffizi, when he invented that song. 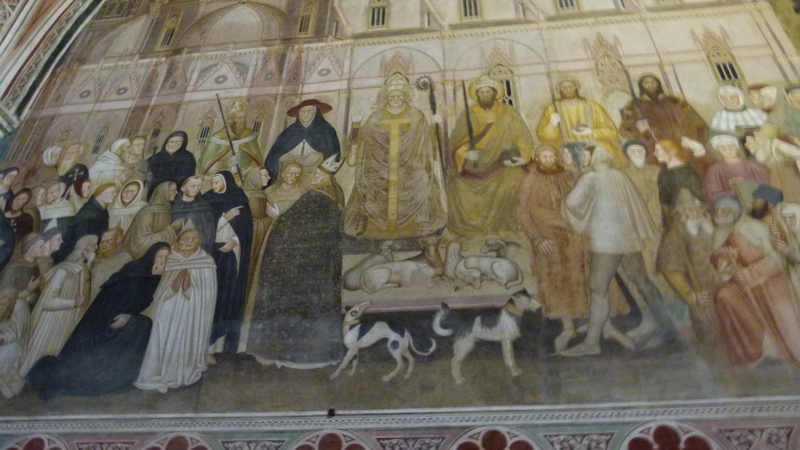 Fortunately the Uffizi are now a museum and panels clearly show the way. 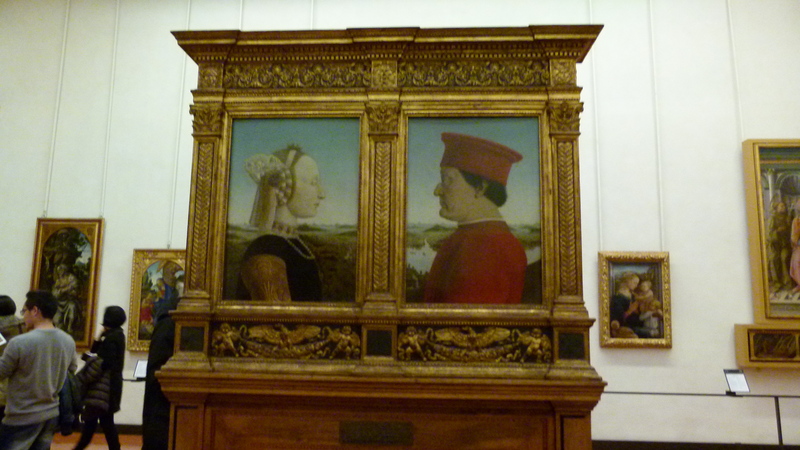 Behind the first door I say hello to the duke and duchess of Urbino, portrayed by Francesco (ca 1470). Why are you so pale, Lady? 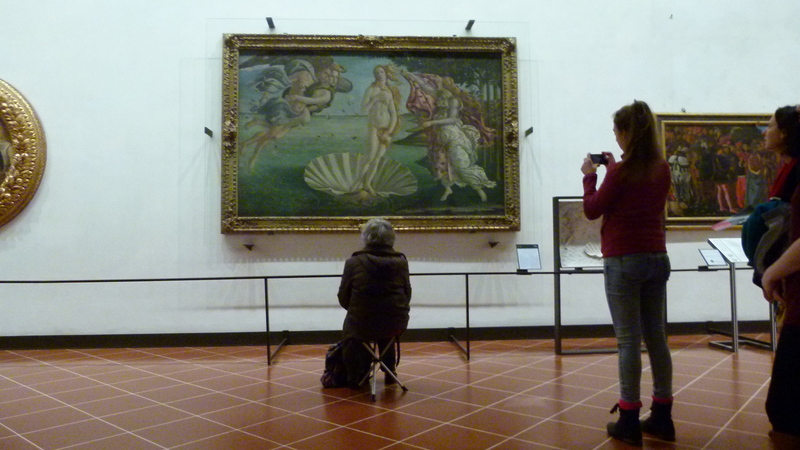 In one of the next rooms there is this highlight of Botticelli, called “the Birth of Venus”. 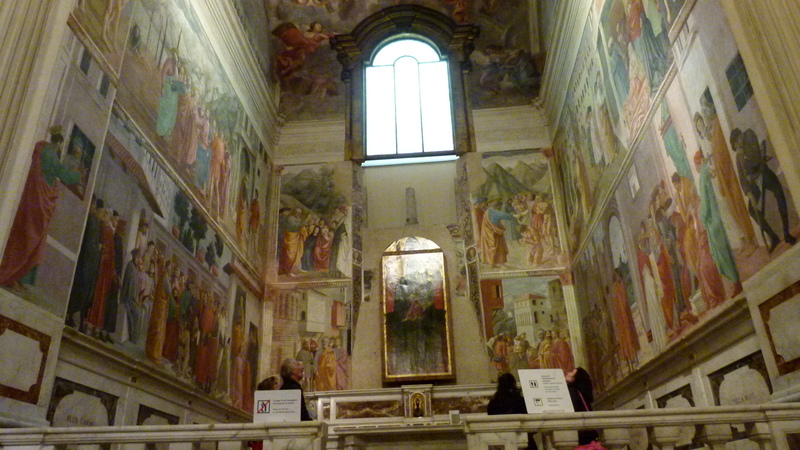 A lady enters the room, walks directly to her Botticelli, opens her chair, sits down and just looks at the painting. 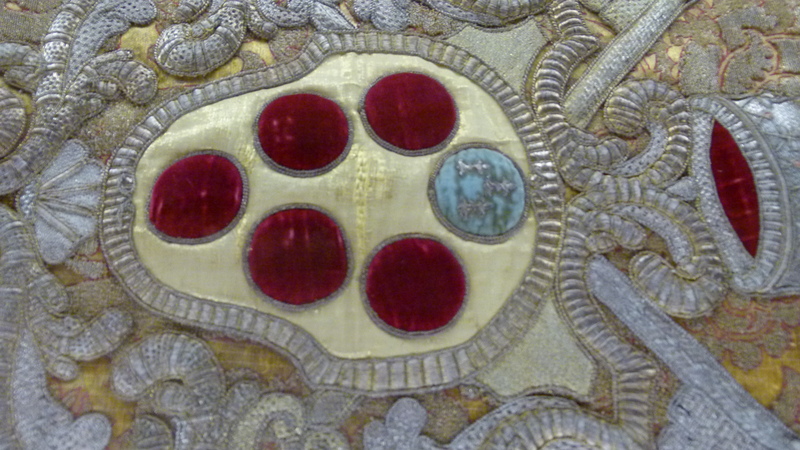 Via email I share this foto with the godfather of my Ernst. 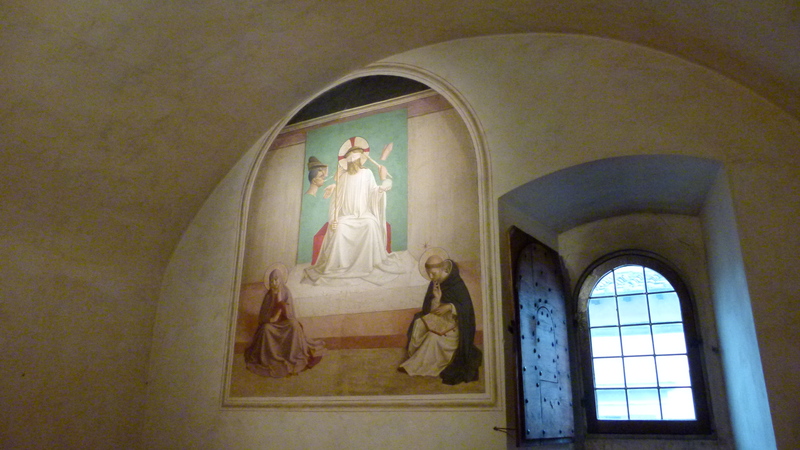 He is also called Ernst and was a priest. Now he his 90 years old. 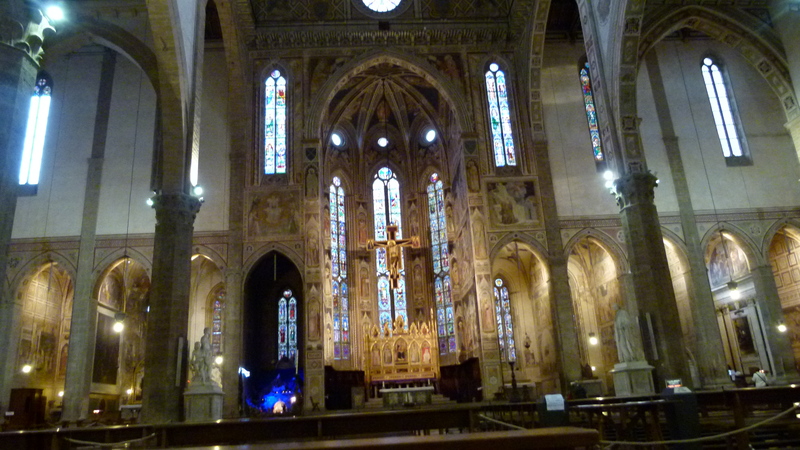 He guides cultural tours to Florence and Rome. 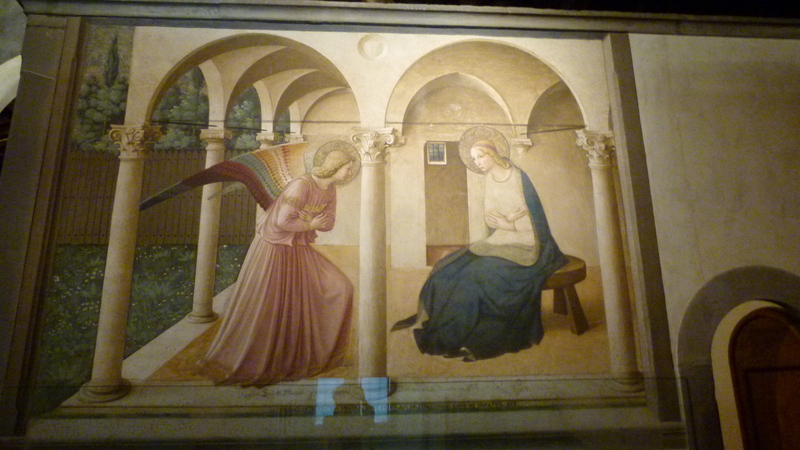 Enthusiastically he writes back: “Look at Botticelli’s wonderful painting. The name is wrong… it is not ‘The birth of Venus’, but it should be called ‘Arrival of Venus onshore’. Look at Zephir. He is blowing to push Venus to the shore and he makes flowers follow her.” Uncle Ernst plans his next tour to Florence in spring. I am sure that his guests will enjoy his lively explanations! One of my favorite artists is Leonardo da Vinci. Well, I know, he was not just an artist, but also a scientist. Dumont says that both paintings in the Uffizi have been completed in the workshop of Verocchio and that Leonardo took part in them. 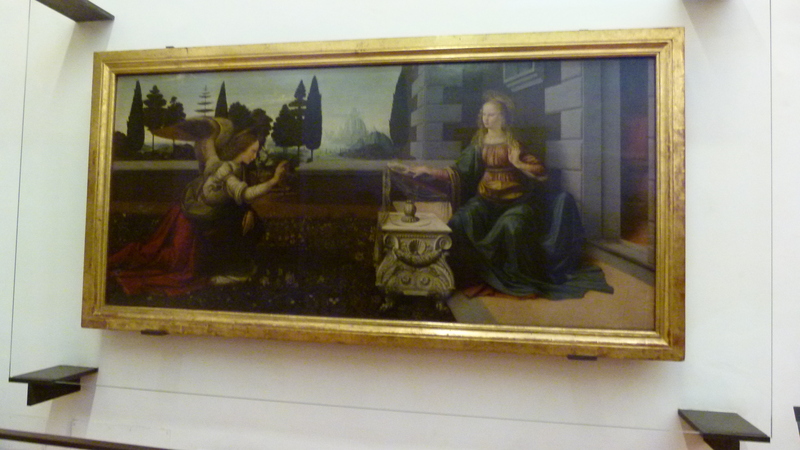 In the “Annunciation” Leonardo must have participated in painting the angel and Maria. 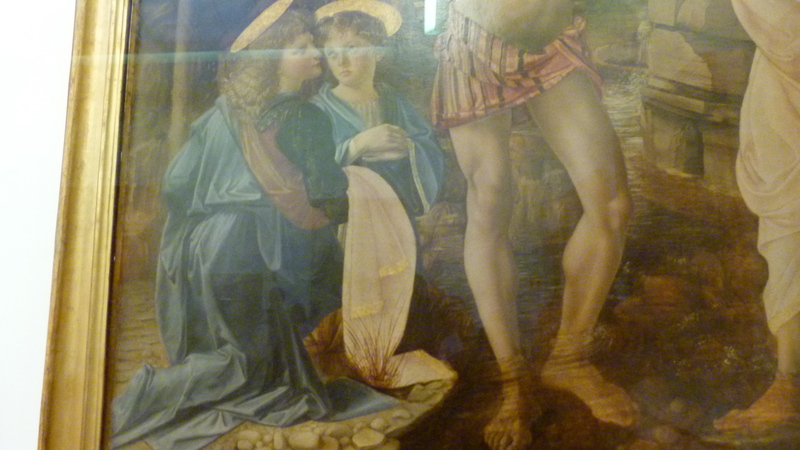 And in the “Baptism of Christ”, Leonardo painted the left angel that is much softer than the other angel. 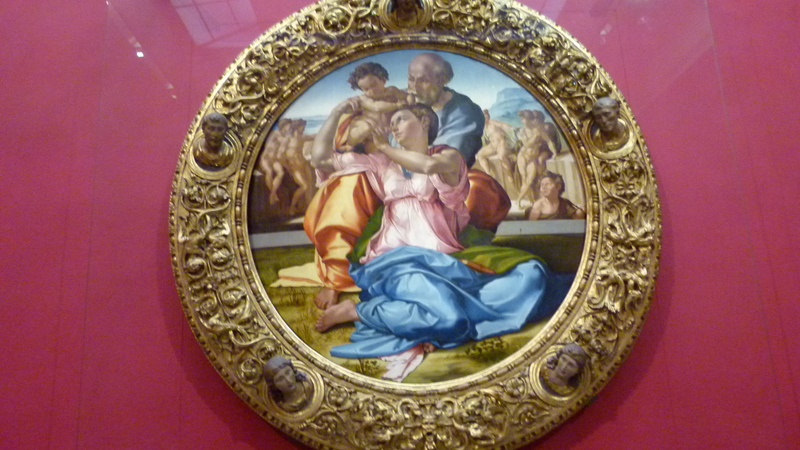 We looked at more paintings of Botticelli, of Ghirlandaio… and then there was also Michelangelo Buonarotti: “the Tondo of the Holy Family”. 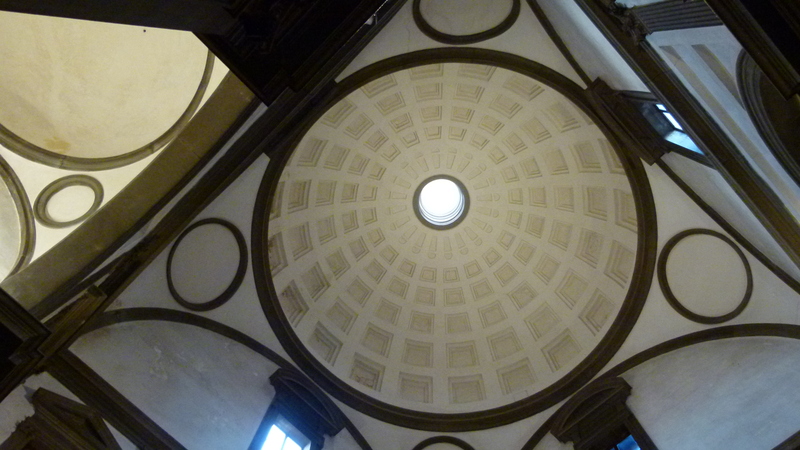 After a coffee we take the next level of the Uffizi, until we feel dizzy. I think I will have to come back. 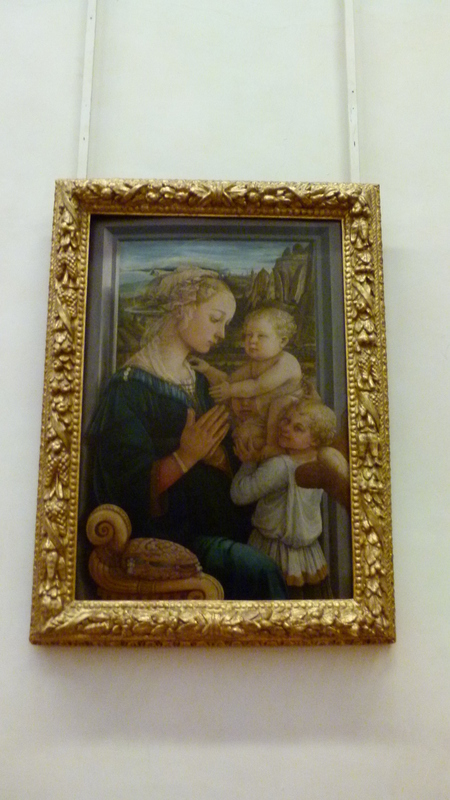 It is not possible to see and digest the Uffizi in one visit of half a day. There is one highlight in the Galleria dell’Accademia that all tourists look for – the original sculpture of David by Michelangelo. 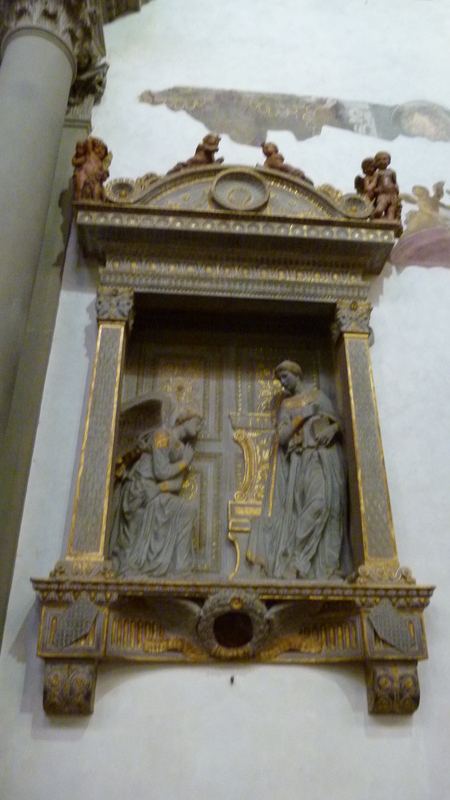 The copy stands in front of the Palazzo Vecchio, where a committee of town representatives had decided to place it, after Michelangelo had completed it. 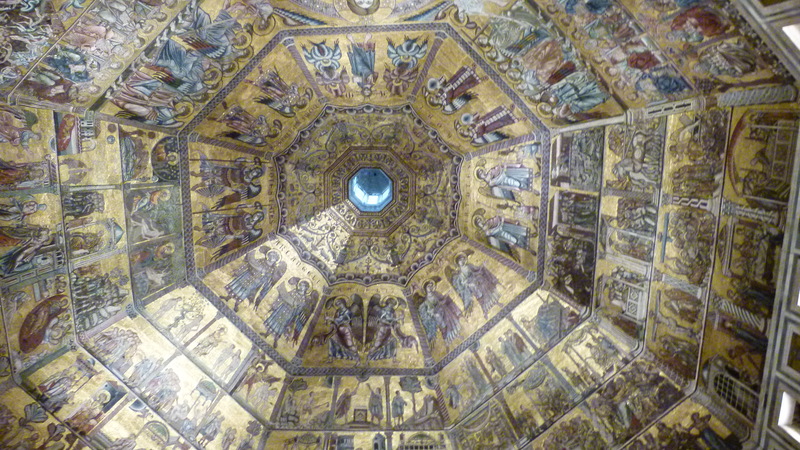 Originally the statue of David was planned to be raised to the roof of the Duomo. Michelangelo cut his David out of one block of marmor and it weighs 6 tons. 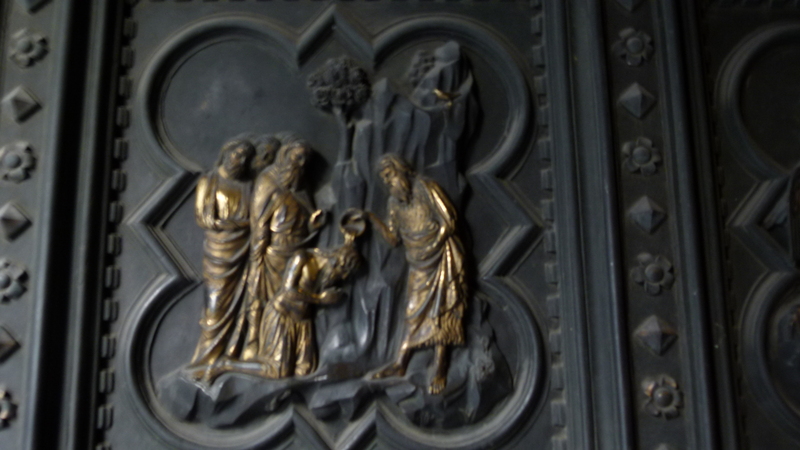 It was impossible to lift David up to the Duomo. And this is why he ended up in front of the Palazzo Vecchio. 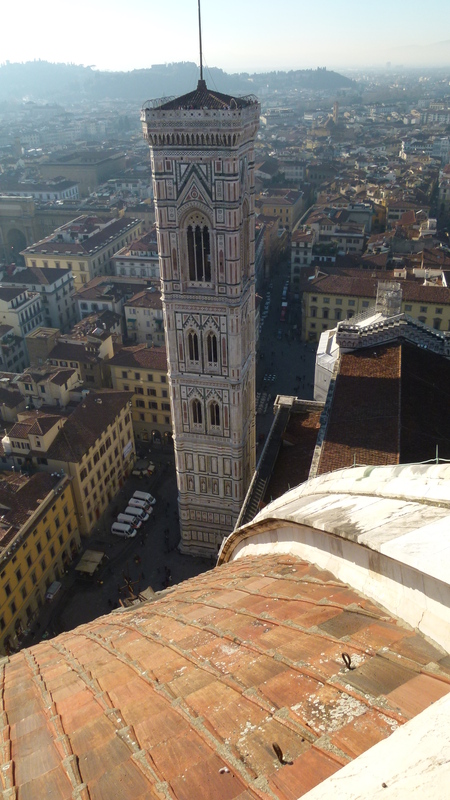 This is also why his hands are oversized – seen from the ground below the Duomo the hands would have been perfectly in perspective. But on the same level they look huge. Florence knows what their David is worth. 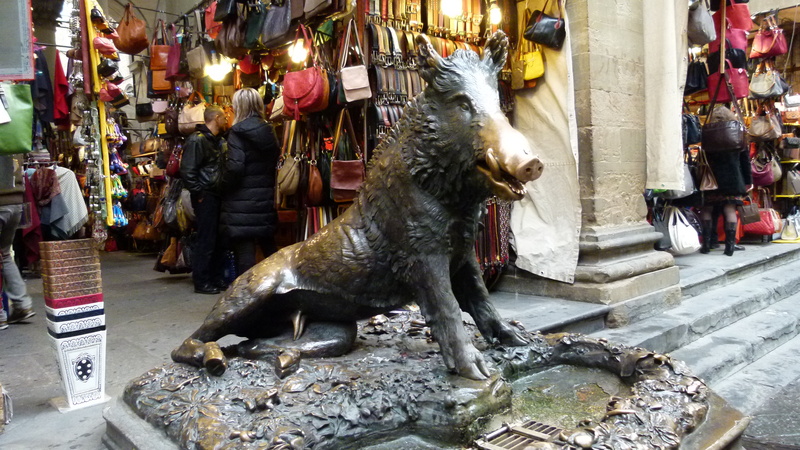 Rome wanted to take it (if not kidnap it), but Matteo Renzi, then mayor of Florence, could convince the Italian government that David belongs to Florence. 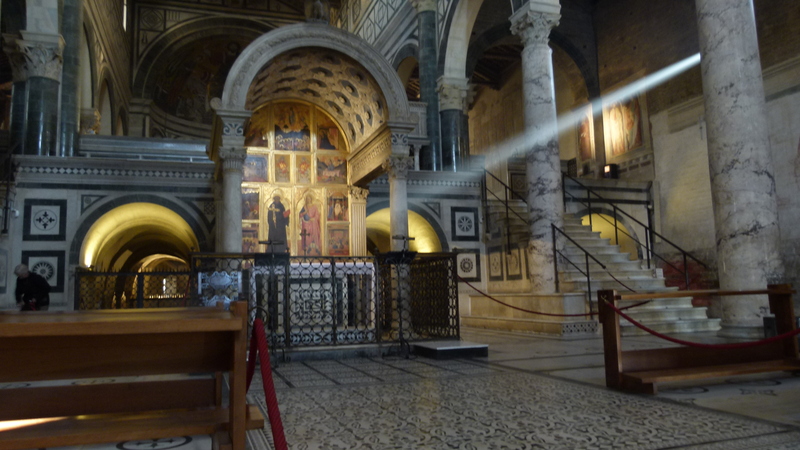 There is much more to be seen in the Accademia. 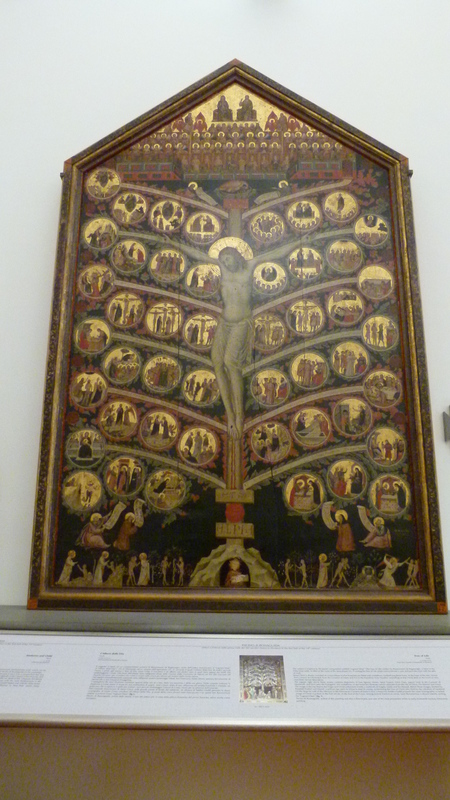 Here is another example, the crucification of Bonaguida in 1310: Each fruit on the twelve branches is said to be a gift to mankind. 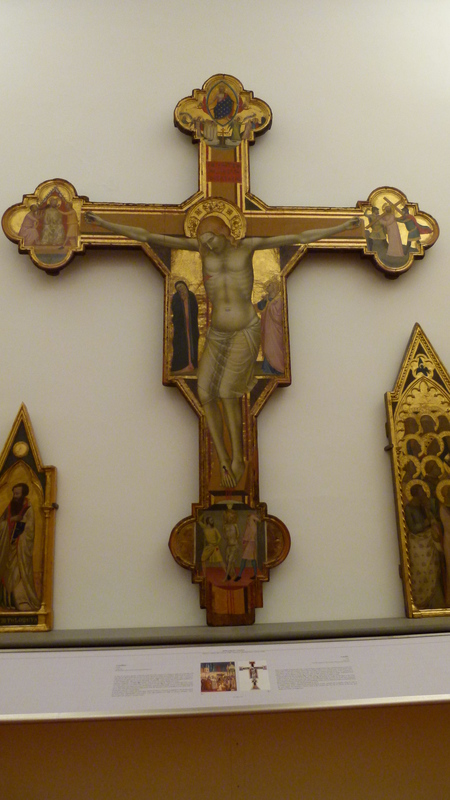 And I also liked this crucification of Bernardo Daddi, 1340, which shows so much suffering in the face of Christ. 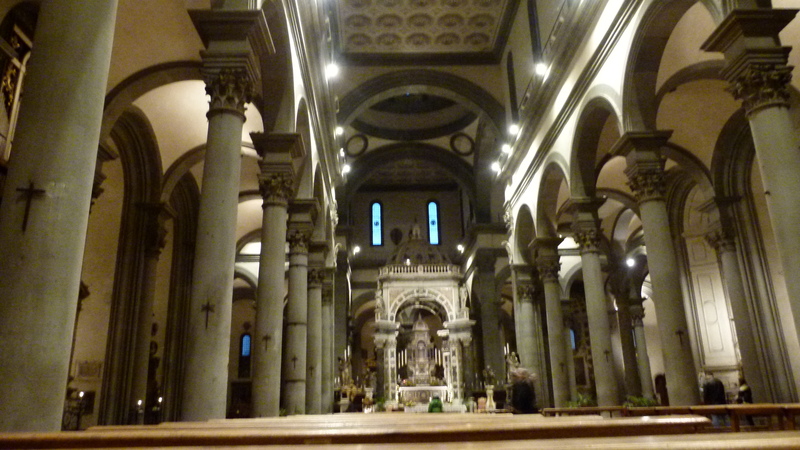 With the Accademia, I am rounding off the cultural highlights that we visited in Florence. Fortunately, we did not end up in a hospital with the diagnosis “overdosis of literature”. 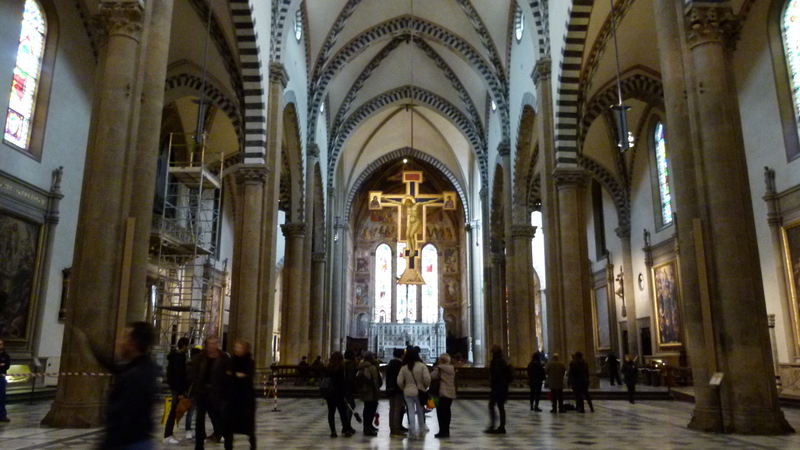 We took our time in the churches and museums and we also relished the atmosphere in this lively town – in markets, restaurants, coffee houses and shops or just strolling through the streets. The palace was built in 1254. 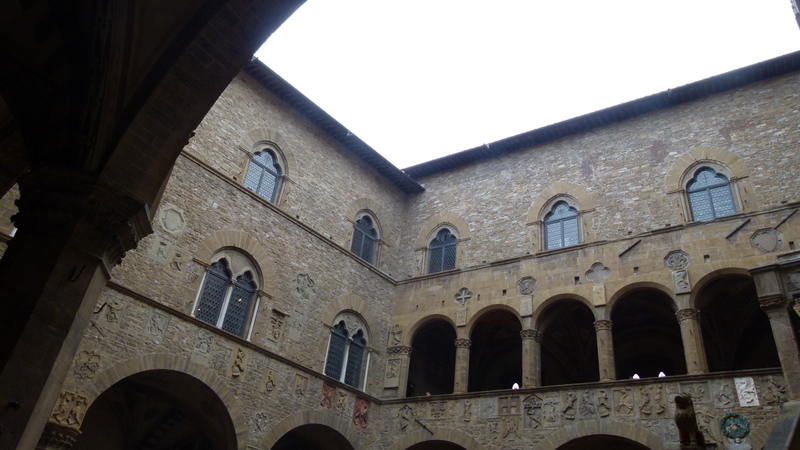 Some say that 40 years later this palace was the model for the Palazzo Vecchio. I can see similiarities and even confused the two buildings in the beginning. Town leaders lived in this palace – sometimes local representatives, sometimes representatives of the German emperor. 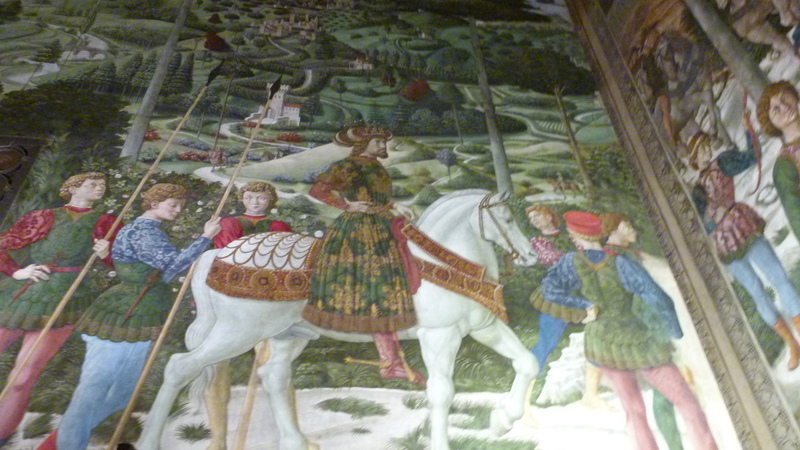 In 1574 the Bargello became the seat of the “bargello”, the head of the Florentine police. Today, the palace is another renowned art museum. 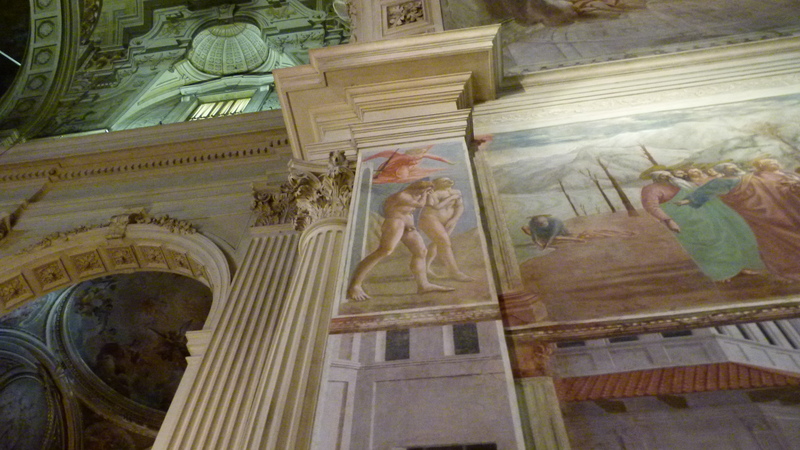 In the ground floor I am impressed by the works of Michelangelo – below is his Bacchus. 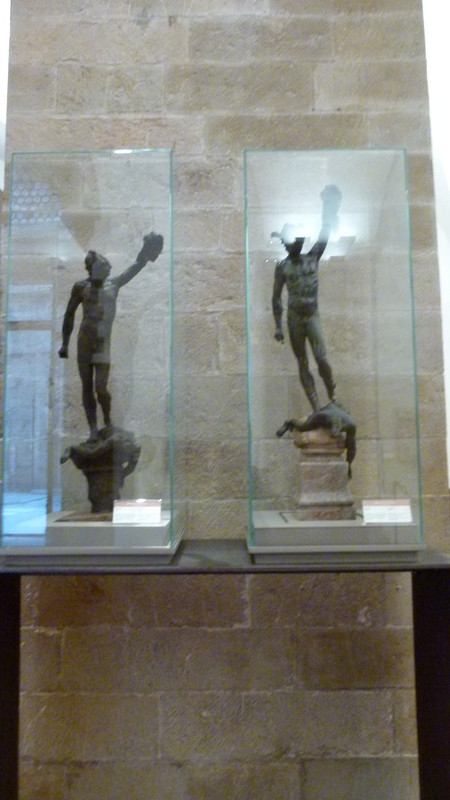 Also on the ground floor are the prototypes that Cellini casted before creating his famous Bronzeperseus with the head of Medusa around 1550. Cellini’s Perseus stands in the Loggia near Palazzo Vecchio. 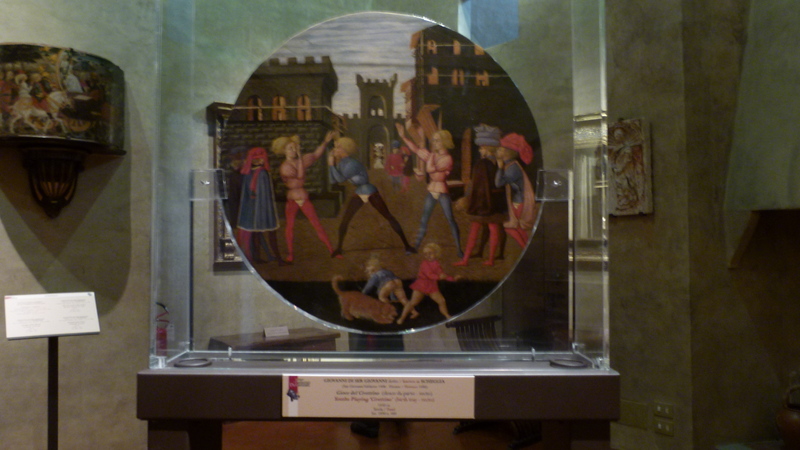 Cellini was a goldsmith. 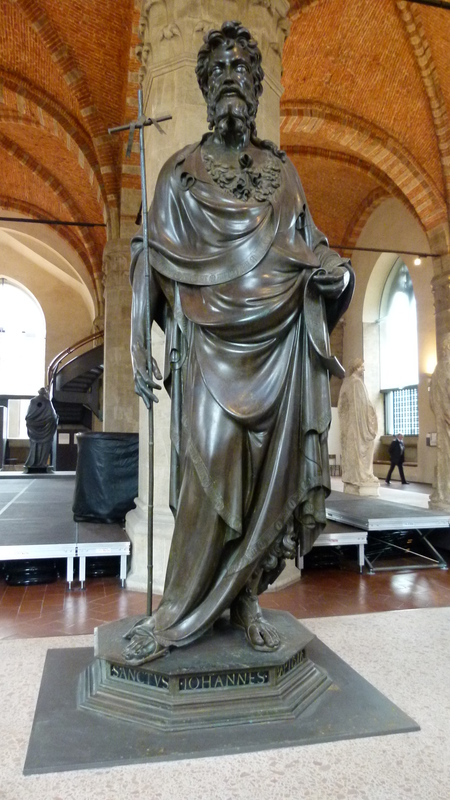 His bust is venerated on Ponte Vecchio. Franz Kotteder gives this title to the biography of Benvenuto Cellini “the life of an artist like an overheated roadmovie” (“Florenz, eine Stadt in Biographien”, Merian 2014). He repeatedly got involved in quarrels and fights. 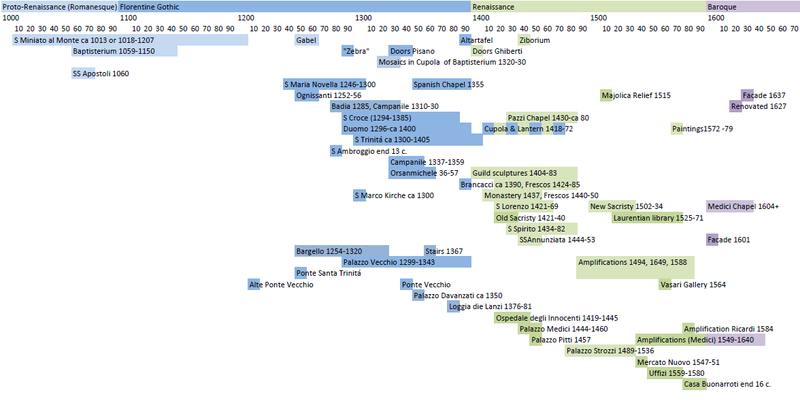 Due to his good connections (even to the Pope) he always obtained pardon. 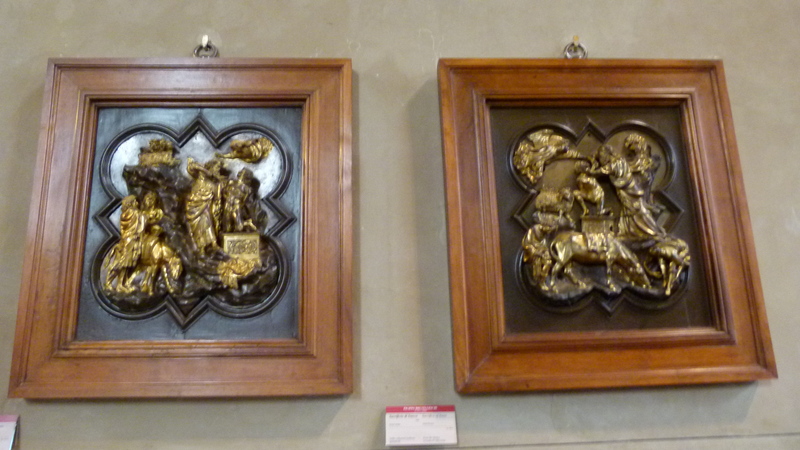 On the first floor there are various gothic and renaissance sculptures and paintings. 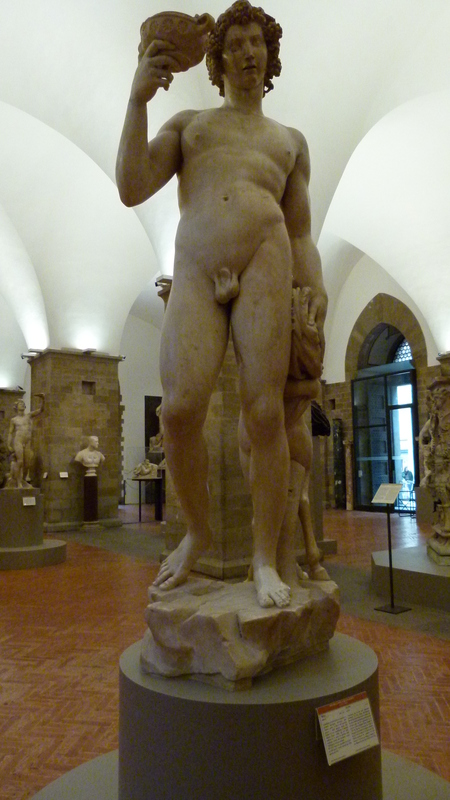 Here is the marble statue of David that Donatello created in 1409 – it attracted my attention. 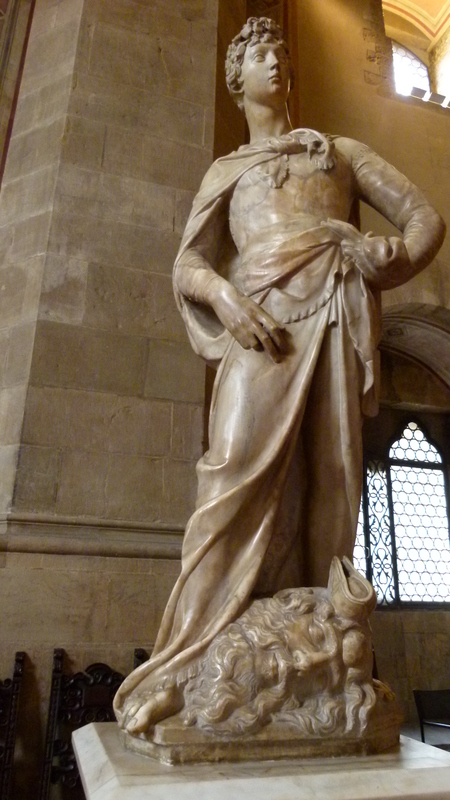 About 30 years later Donatello made a second David out of bronze that is more famous than his first David. 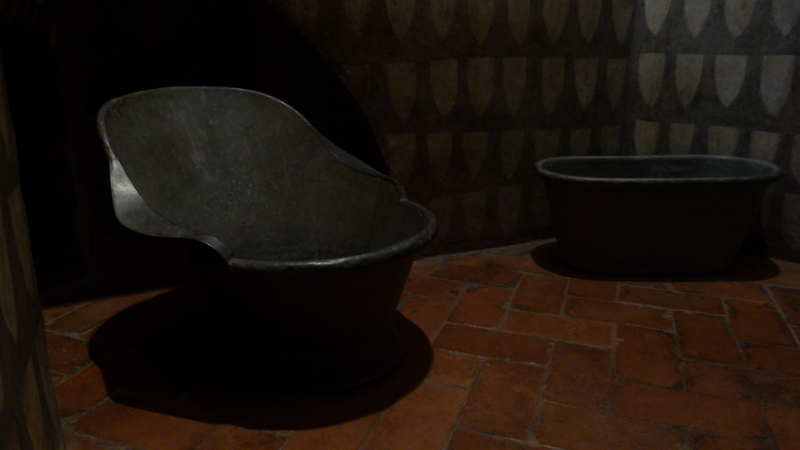 On the first floor there is also an exhibition of artworks from various countries. 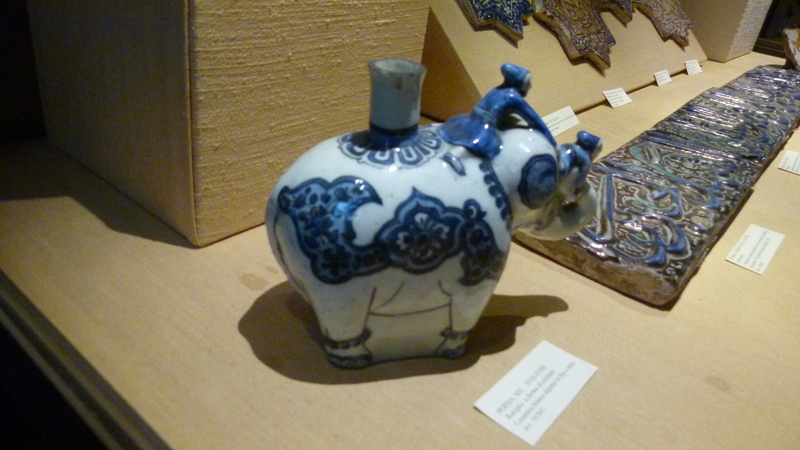 For instance this porcelain elephant from Persia. Originally the Palazzo Vecchio was called “Palazzo della Signoria”. 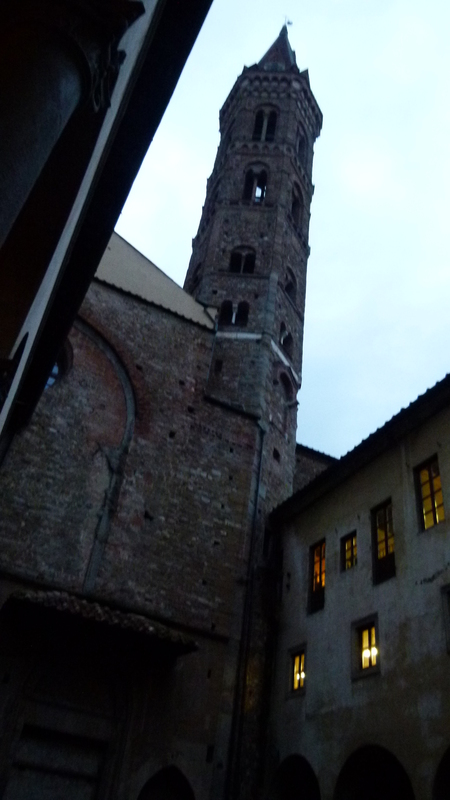 It was built between 1299 and 1343, as the townhall for the town republic or the place of work and residence for their “Signoria”. 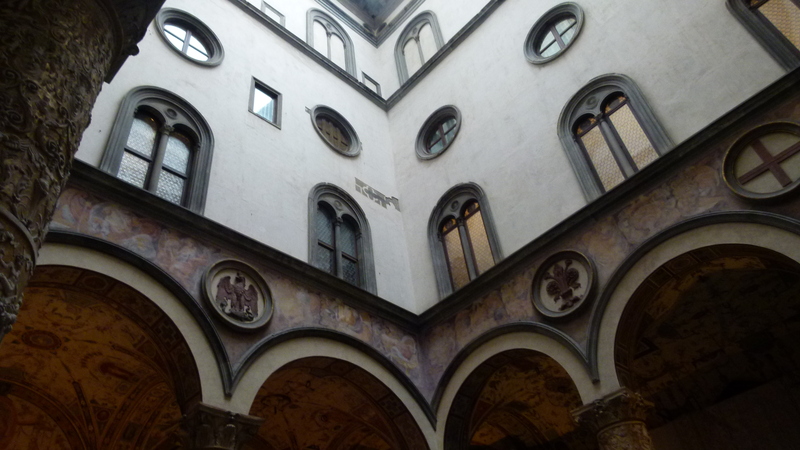 The Palazzo was amplified several times, for instance in the 16th century, when the Medici reconstructed it – it was then their “Palazzo Duccale”. 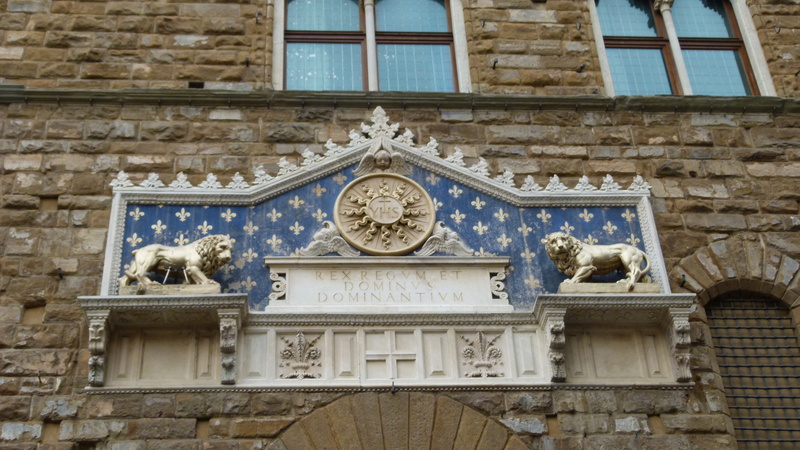 When the Medici moved to the Palazzo Pitti around 1570, they renamed their “old” palace to “Palazzo Vecchio” Above the front door are lions protecting the lily flowers. Lions and the flower are symbols of the town. Often they appear as a lion protecting a lily with his paw (called “Marzocco”). The lion is the symbol of the pope or the Guelphs (symbol of freedom as opposed to the eagle that is the symbol of the German emperor). 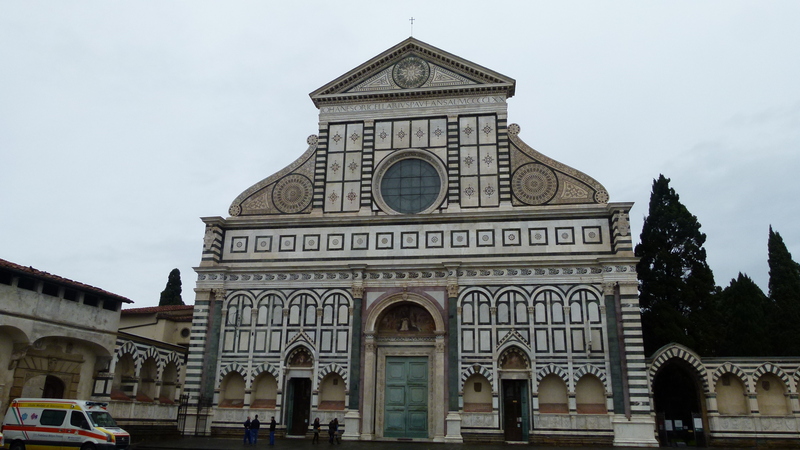 Why the lily became the symbol of Florence is subject to guesses. 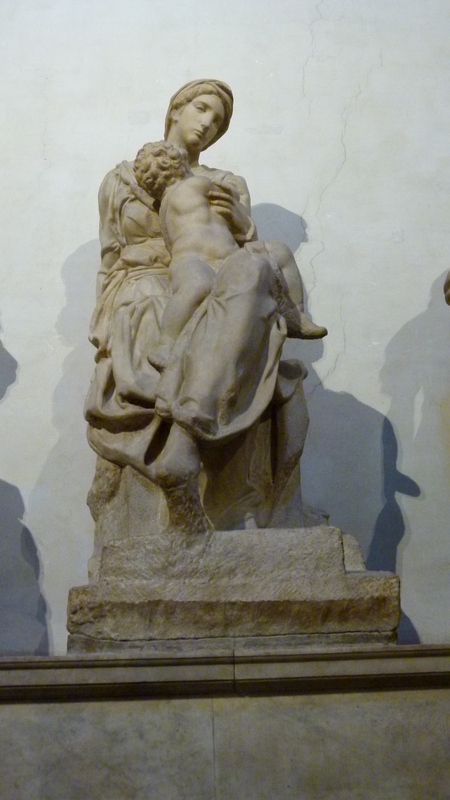 Some say that the goddess “Flora” had founded Florence. 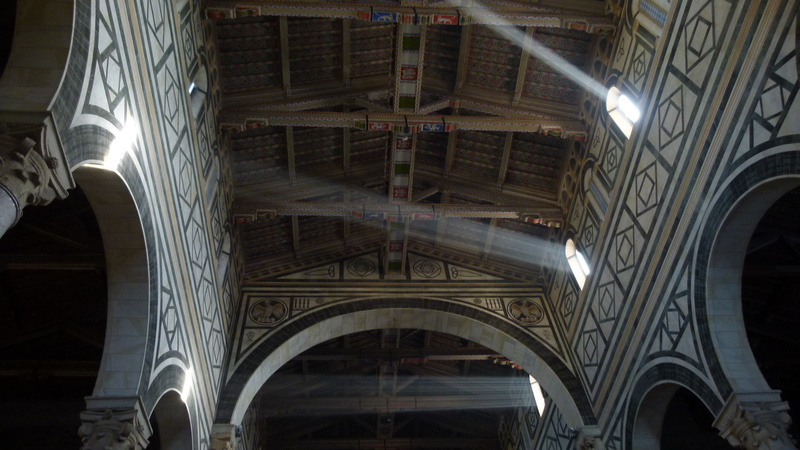 The Palazzo Vecchio can be visited, but we decided to postpone it to our next trip to Florence. 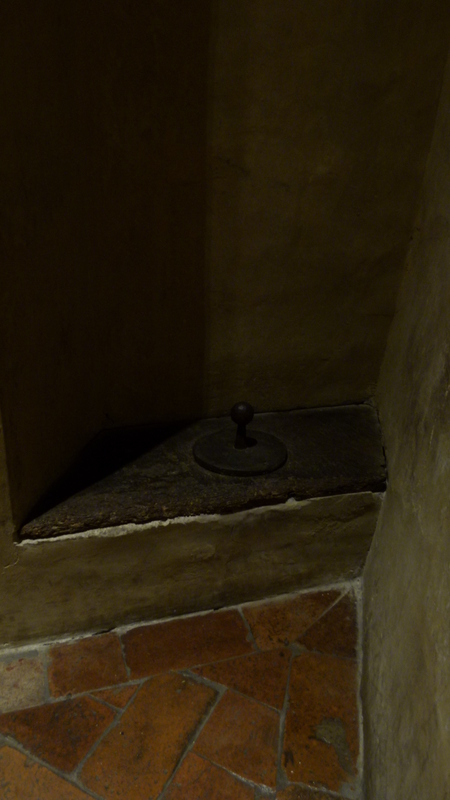 This is an impression taken in the first courtyard. 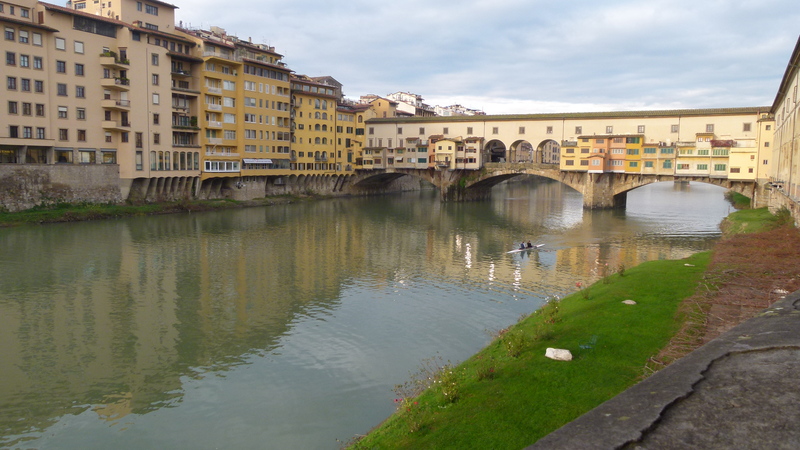 The Ponte Vecchio is THE place in Florence. If a tourist does not remember anything else, he always remembers this bridge crossing the Arno. This bridge was built around 1340. 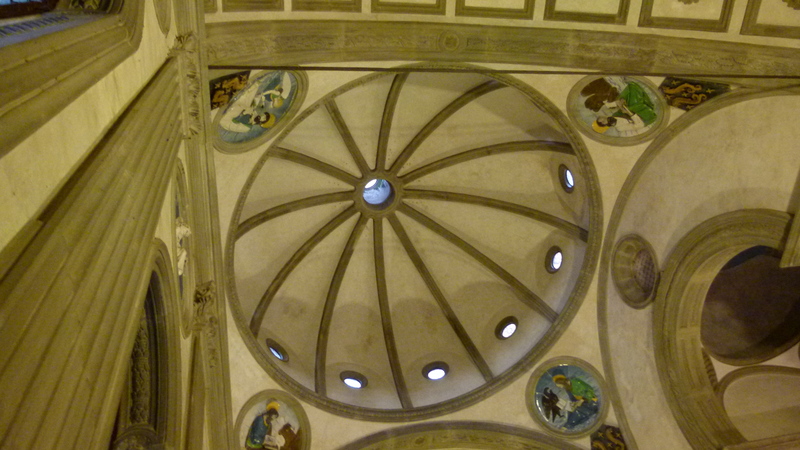 The common roof above the small houses is the Vasari Corridor. 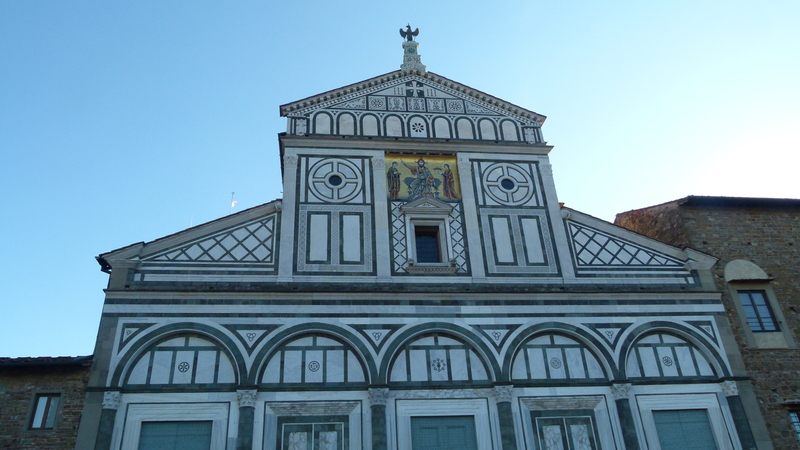 It was ordered by the Medici after they had settled in the Palazzo Pitti around 1560 to connect their “new” palace with the Uffizi and their “old” palace. Until 1593 there were butchers in the small houses on the bridge, but the dukes did not like the smell, when walking through their corridor. They doubled the rent and goldsmiths and jewelers moved in (Dumont). 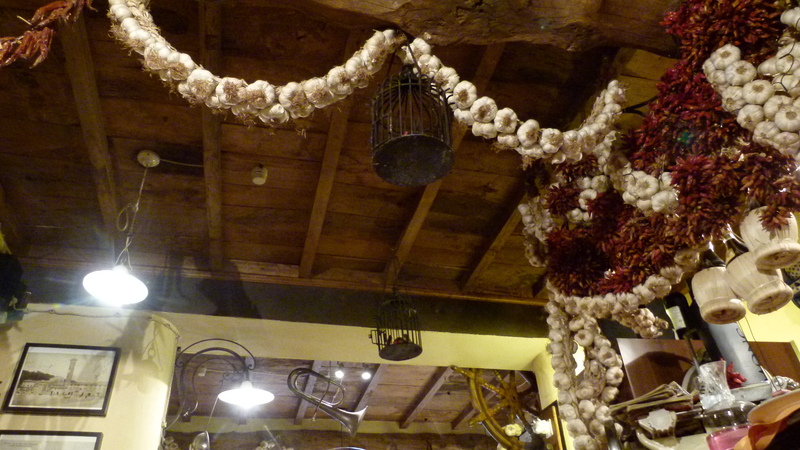 We spent quite some time with one of the jewelers in his shop. From his workbench, he has a great view of the Arno. There are many, many rich palaces in the city center. 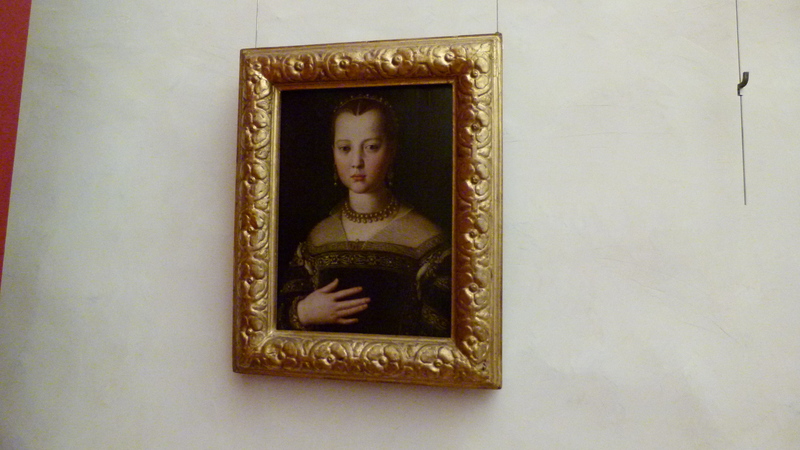 We visited one of them, the Palazzo Davanzati. 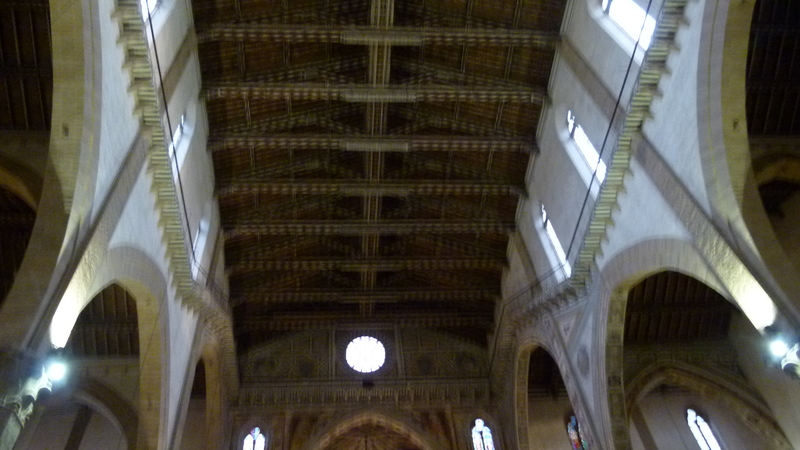 It was constructed around 1350. I am impressed how modern this palace is. 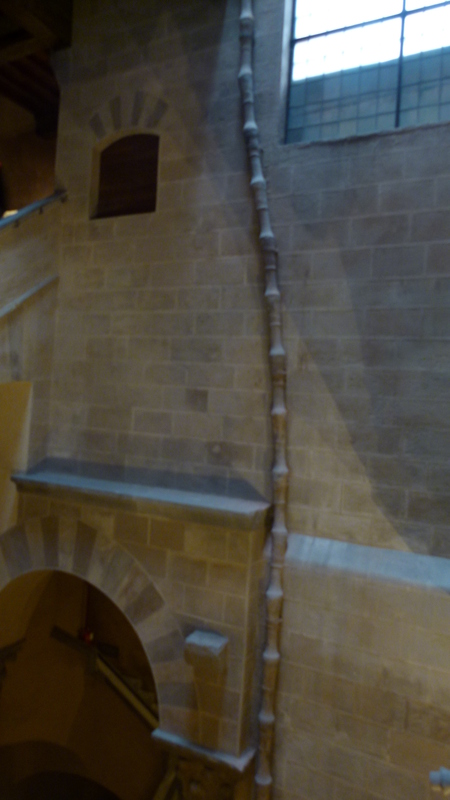 A tube brings water into the upper floors. There is a toilet on each floor. And there is a bathroom on each floor. 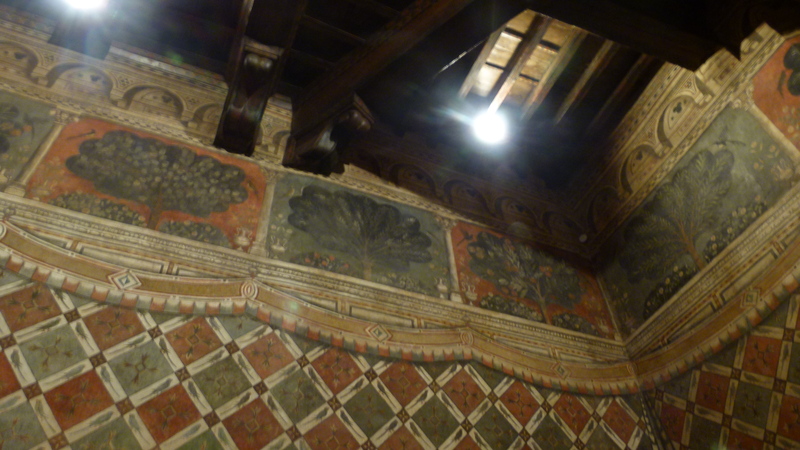 The most beautiful salon is the Papagalli room with the frescos covering the walls. 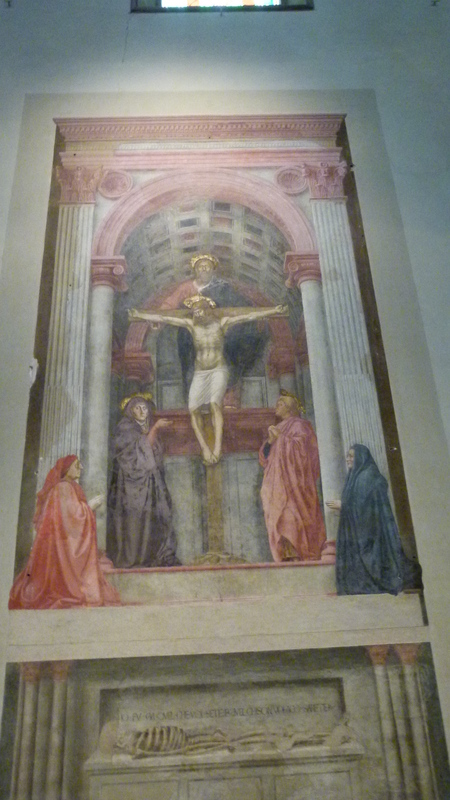 In one of the rooms we come across the brother of the famous Masaccio that died at the age of 27 after having painted the magnificent “Expulsion from the Paradise” and the “Crucification”. His brother Scheggia painted scenes from everyday life – and this helps today to understand what life in Florence was like. 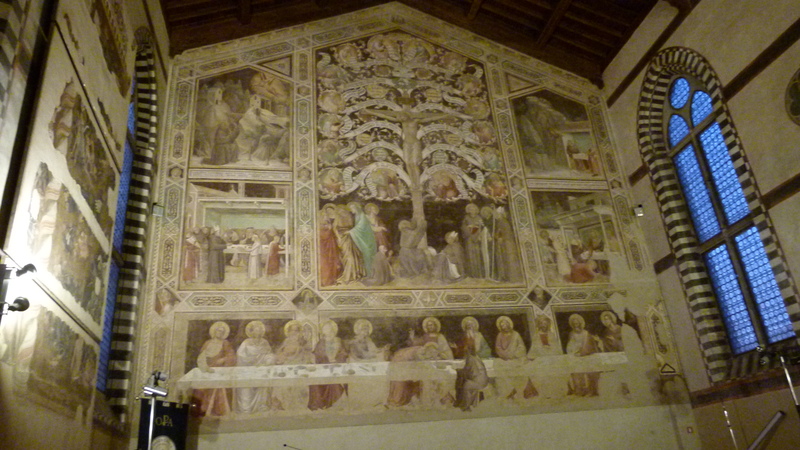 The Ospedale degli Innocenti or the house for the orphans is not only a great piece of Renaissance architecture built by Brunelleschi, but it was also a very social institution. 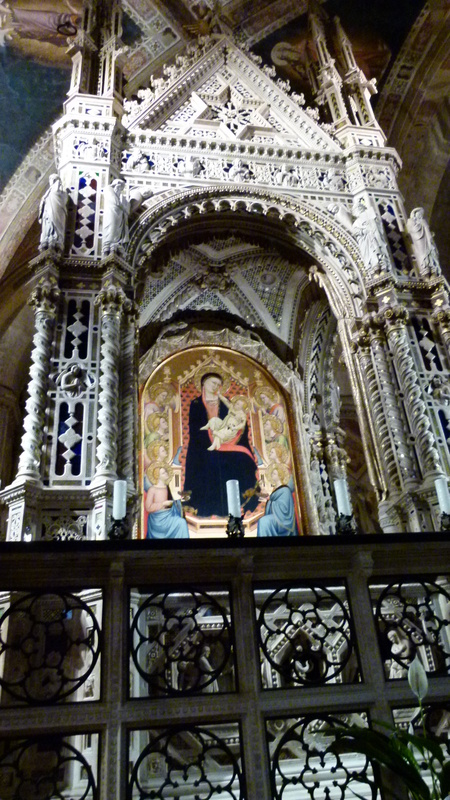 It was completed in 1445. Today it is still an orphan house, and also a museum. 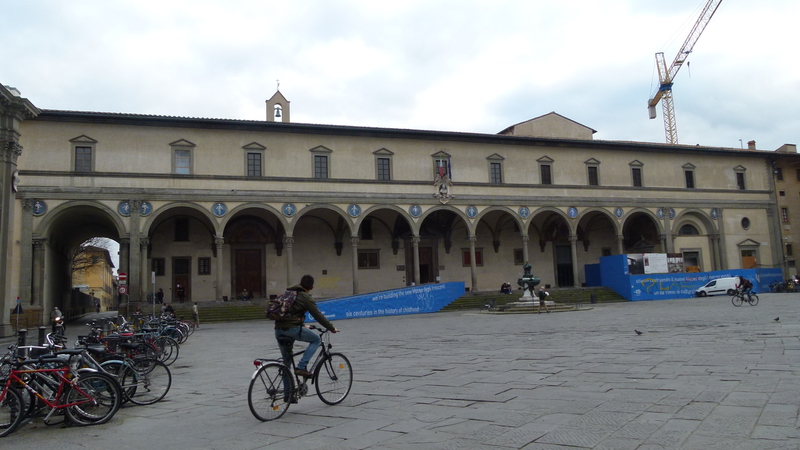 We just enjoyed the harmonic architecture of the Piazza SS Annunziata dominated by the archades of the Ospedale and the church. 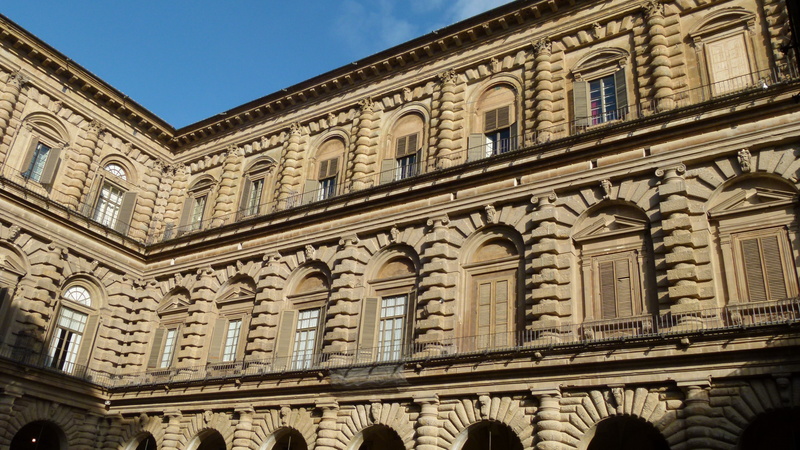 The Palazzo Medici, Renaissance from around 1450, was later amplified by Ricardi after they had acquired the palace in 1584. 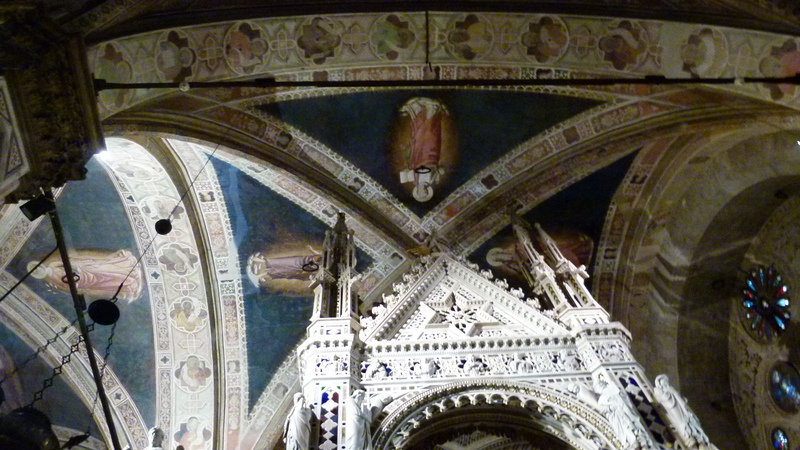 THE treasure here is the small chapel with the frescos by Benozzo Gozzoli, ca 1460, showing the adoration of the kings. 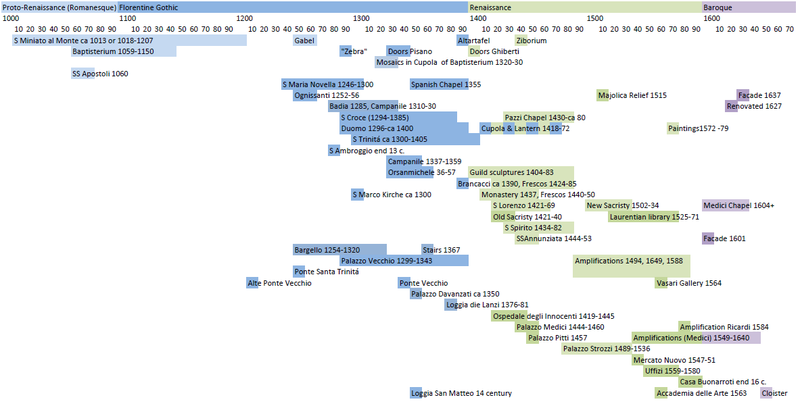 There are guidebooks that claim to recognize the Zar from Byzanz and the Patriarch from Jerusalem as wel as Lorenzo Il Magnifico. Dumont does not believe this. He just recognizes Piero de Medici and the artist. 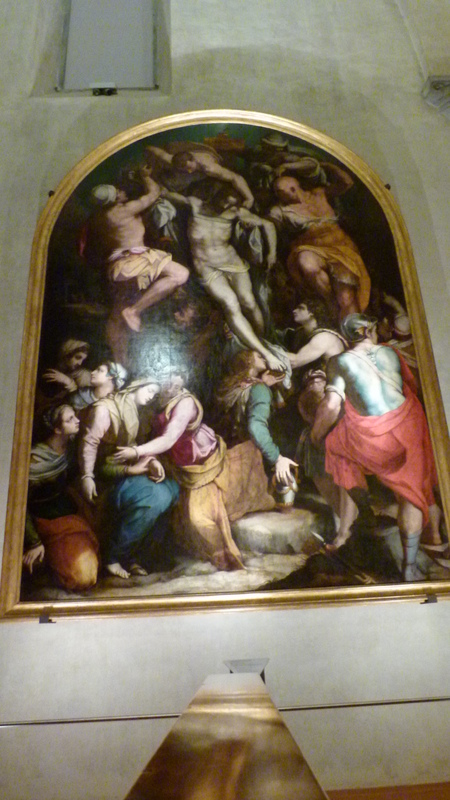 Let us continue with the Palazzo Pitti, the Uffizi and the Accademia in one of the next blogs.